Perhaps the saving issue is browser-related? I played a few levels in Google Chrome, closed down all instances of Chrome, then re-opened, and my game was saved, so it seems to keep games fine in Chrome. 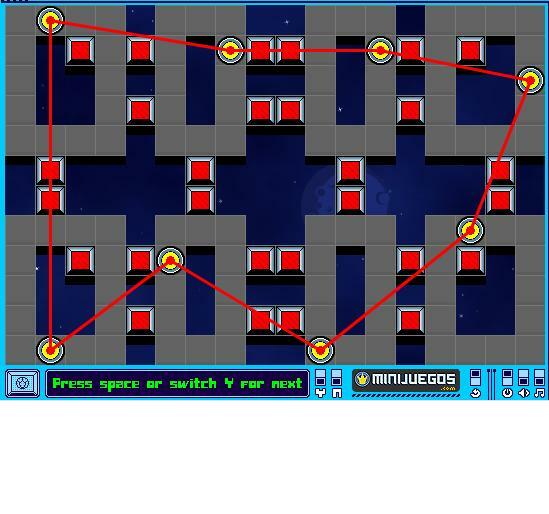 My only gripe: When you end a level, there are several seconds of score-tallying followed by a loud radio-static buzz. The radio-static noise is louder than any other component of the game, and is consistently irritating. I wish I could keep the sound effects but nix that. 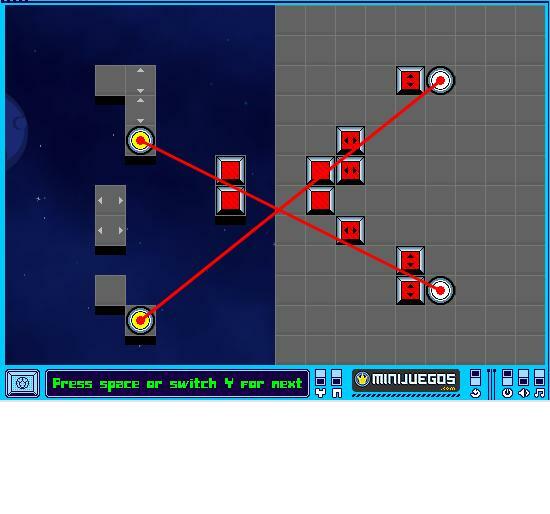 The lasers are all fixed, and some of the blocks to be lit are fixed, while others are movable. 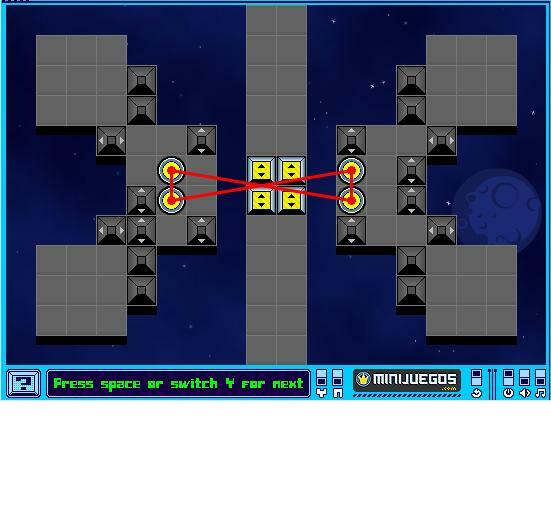 My movable blocks can light up, but none of the non-movable blocks light up, even when they're obviously within the parameters of lightable--that is, they're clearly intersected by a working, non-blocked laser. 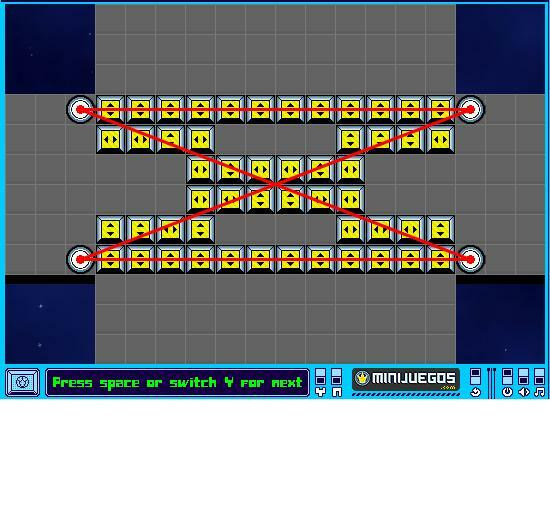 In fact, all eight non-movable blocks start like this, and should be lit, but aren't. Am I missing a gameplay element, or is this a bug? This is in fact a gameplay element. Keep in mind that some lasercells are on to begin with, and are switched "off" when there's a laser going through them. So I have to go through this all in one go? Darn. I never had a problem with the auto-save. I think it's a rare issue. 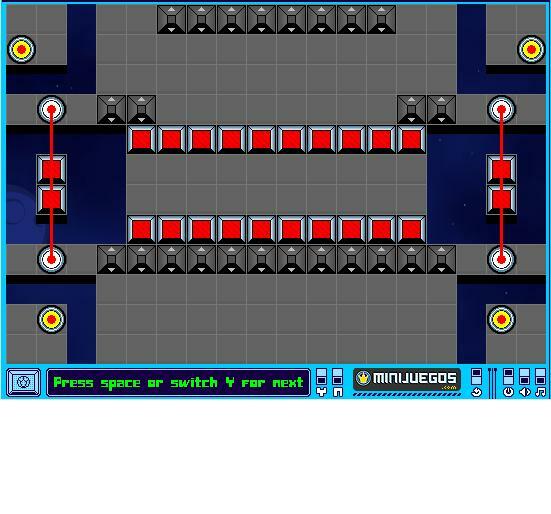 It just might be worth reloading the game after a couple of levels to see if your progress is being saved. 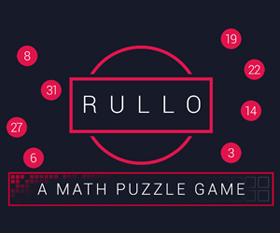 Fun puzzle game, but I will say the scoring system is dumb. 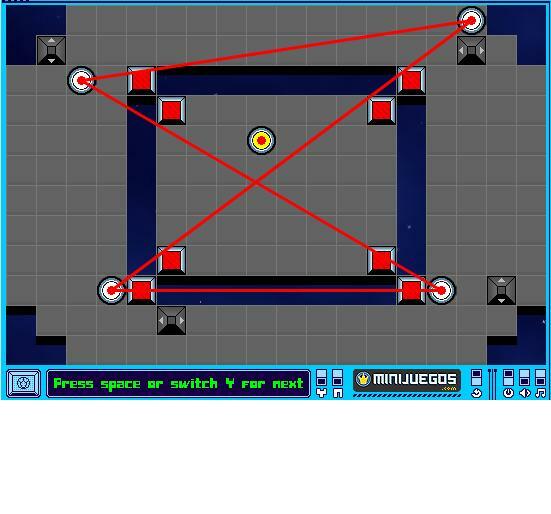 The number of moves you take has little to do with how well you figure out the puzzle, and more to do with how patient you are at painstakingly dragging around the lasers. I would much rather it let me place the laser anywhere, without having to go around walls and such, since the piece never really kept up with my mouse. Ah, I see, some levels have islands... interesting. Seriously JayIsGames users? 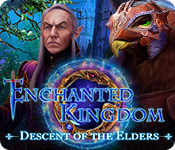 This excellent and relatively unique puzzle game gets 3 out 5 stars, and every game that's a rehash of the tired old escape-the-room and tower defense genres gets 5 stars? I swear I don't know you people anymore. Anyway, anyone figure level 35 yet? I'm stumped. ninti - It seems to me there are people who rank games based on the screenshot and whether that makes them want to play the game. "Hmm, this game looks like crap, I'm not even going to play it... 1/5." I'm stuck on level 9. The movable walls are really limited and I can't seem to be able to fully move them out of the way. nevermind worked it out. thanks. Is level 20 even possible? 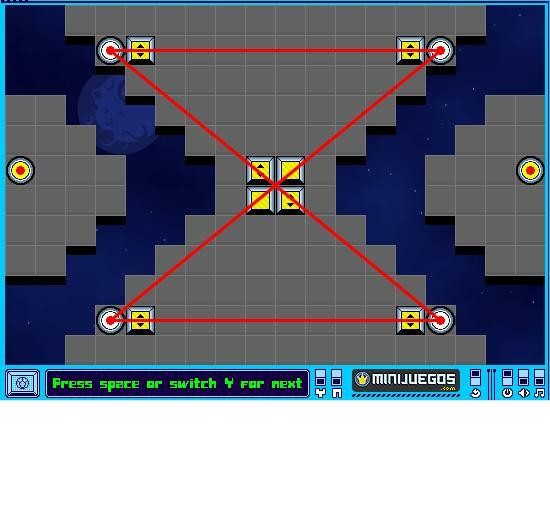 Because of the way the lasers are linked, two of the lasers will always pass through the center of the grid. 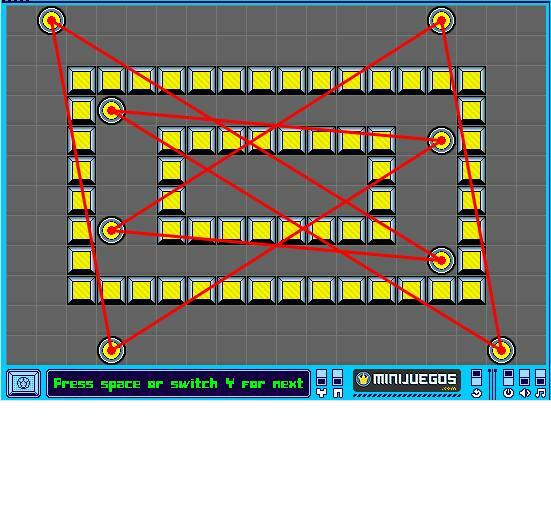 Since neither of the endpoints can fall ON a gridline (only between them), there will always be a laser beam travelling through the squares near the center of the grid. 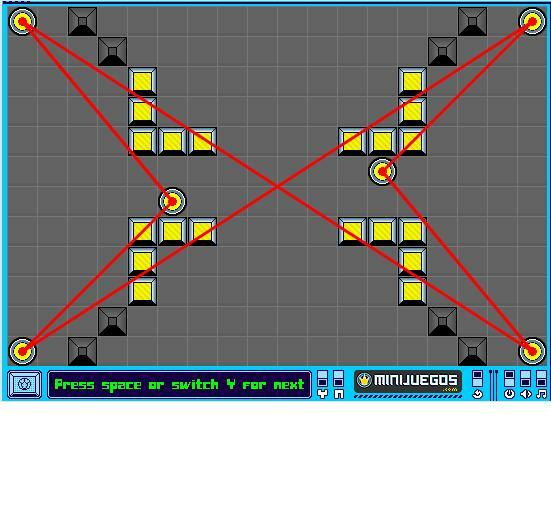 However, these squares turn OFF when a laser passes through them. As far as I can tell, there is no way to avoid the situation, so the puzzle cannot be solved. 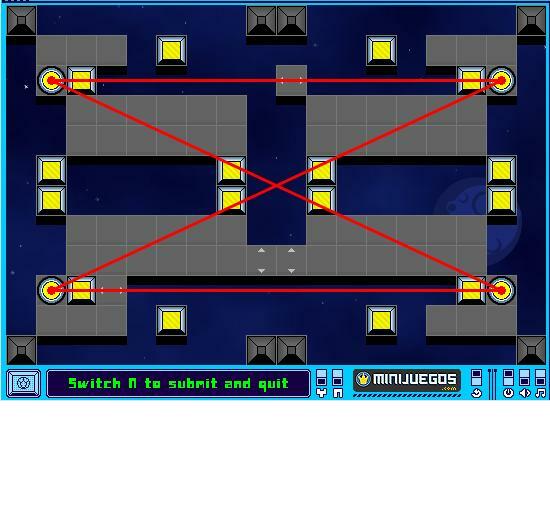 If you move one of the laser spots and the connected ones can't move, then they don't. You can use this to "push" the configuration around. 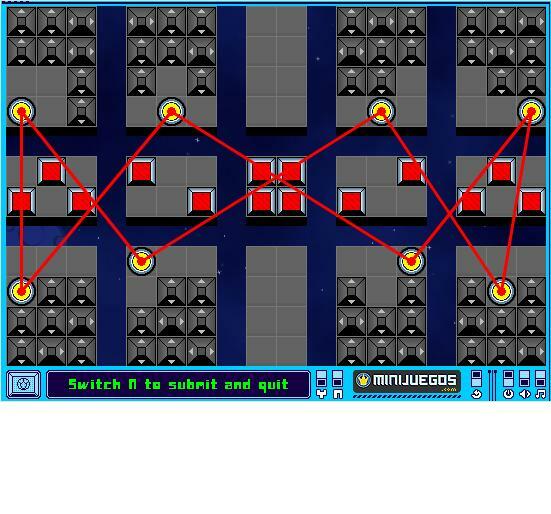 Hmmm, level 43 is proving to be difficult. 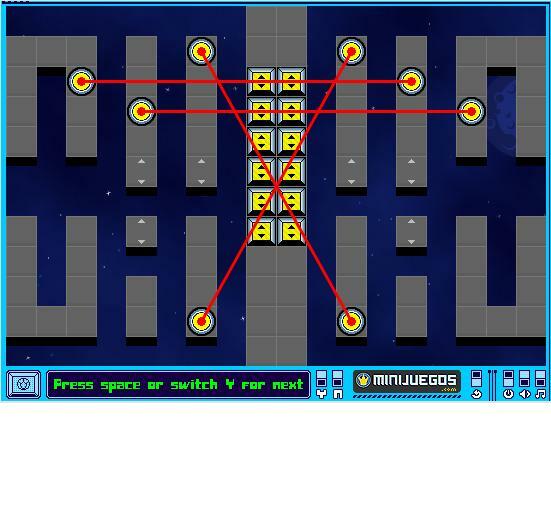 How do you do level 18? 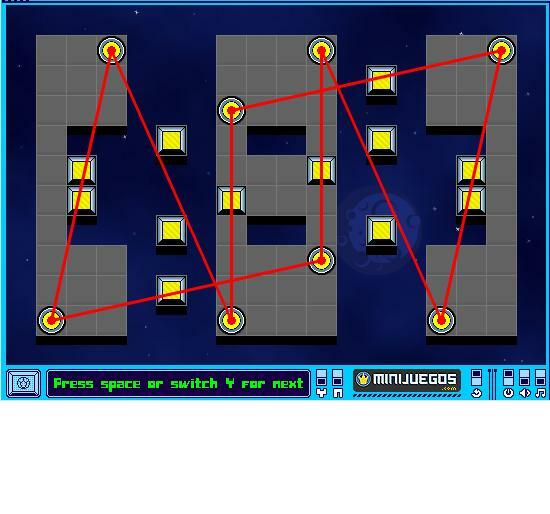 Anyone got any hints for level 73? yeah level 73 has been smarter than me for several hours now. it's like i ALMOST have it, but there are still 2 or 3 unlit blocks. 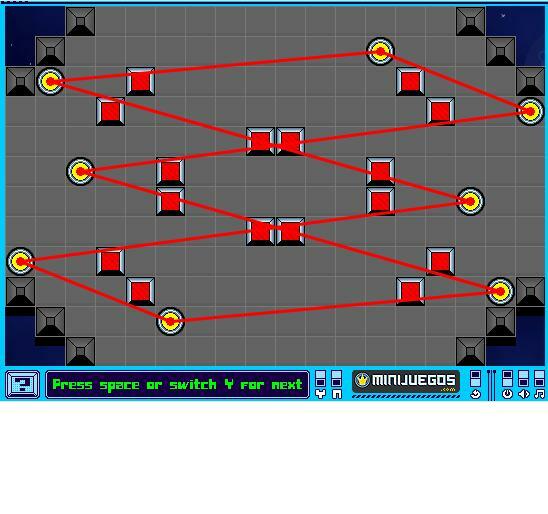 ricainrico/Guest: Yeah, level 73 is quite tricky. 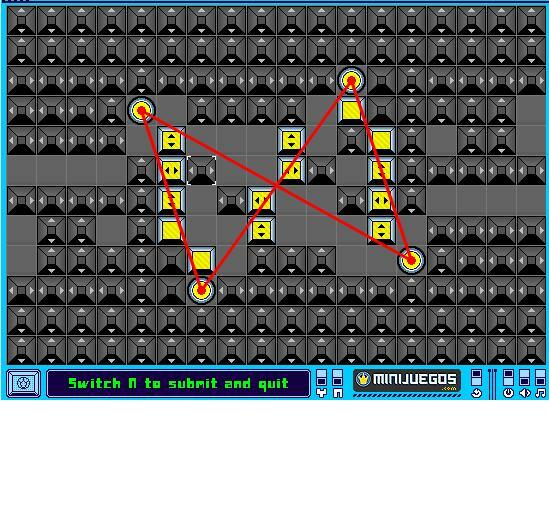 anyone got a clue how to solve it? i would really appreciate it! okay, got 17, now have all lit but one on 22... I thought I was doing so well! Okay, I must be stupld, but... lvl 5? 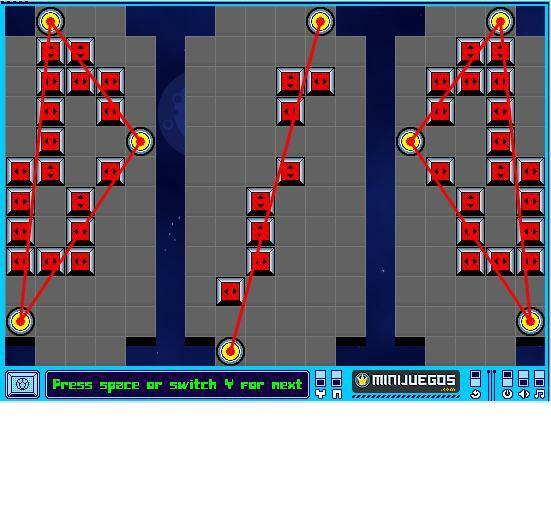 I feel pretty stupid.I just spent about two hours trying to turn off all the lit blocks on level 5. wonderful. 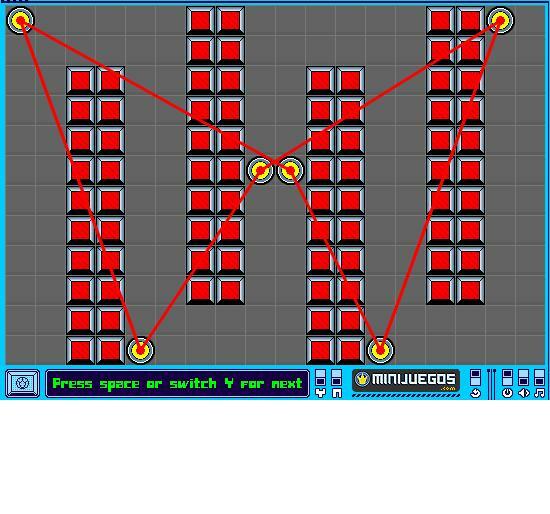 the best part is that i got through the levels beforehand, so I must have known to light the unlit ones. First, you have to switch the two cells at the left OR the two at the right. Don't switch both sides! Let's see the switch at the left. - Then you have to get a vertically moveable out of the way of the horizontally moveable panel in the 5th line from the bottom. 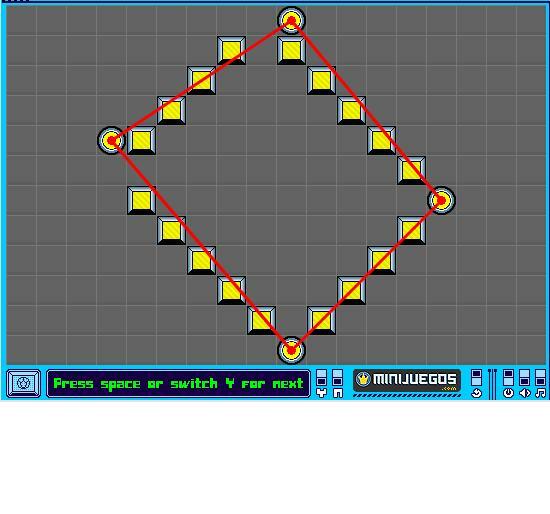 Place the horizontally moveable ones to the left so you can move the upper cell (c2) next to the other. 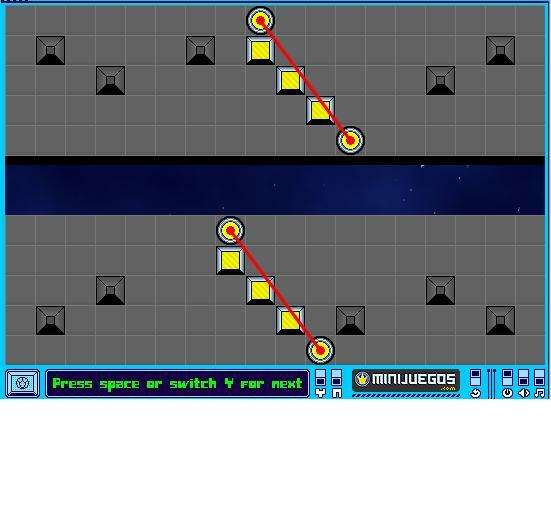 - Go up with c1 to the original place of c2, then onto the closest upper right unmoveable panel. Then to the one which is at the right close to the bottom. Then down again, to the right. And then up. It's the trickiest - and the hardest to tell. But if you manage to reach the unmoveable in the 2nd line (column 5) you are almost there :) Good luck! 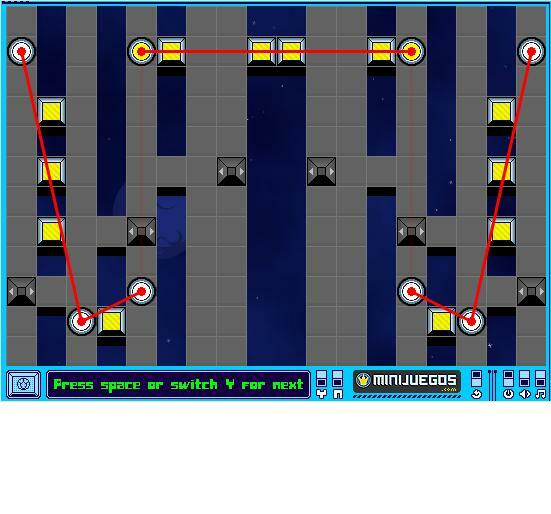 I am stuck on level 91. Laserspot order seems to be significant here. i.e. 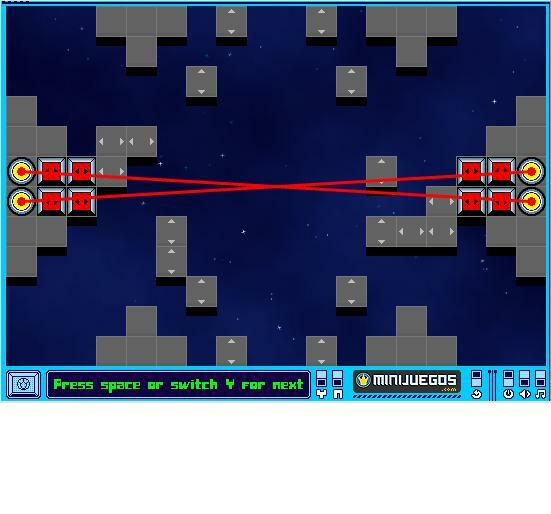 when multiple laserspots are being moved simultaneously, they will each attempt to move in a predetermined order. If one tries to move and another is blocking its way, it will not move, even if the other one moves out of the way. But if the one blocking the way moves first, then both will move. I will work on finding a solution, but until then, any solutions you can offer would be appreciated. 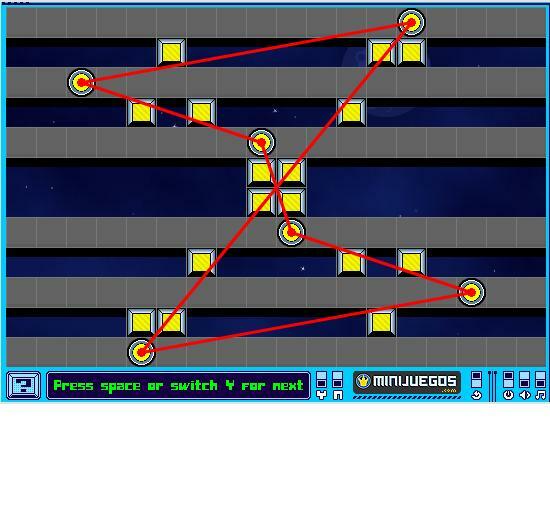 In return for this, I offer you step-by-step walkthroughs for some of the other levels. Objects have been numbered in reading order (left to right, top to bottom), so HF1 would be the first horizontal movable floor in reading order, VLC2 would be the 2nd vertical movable laser cell in reading order, etc. Non-movable/white laser spots are not included in this count. 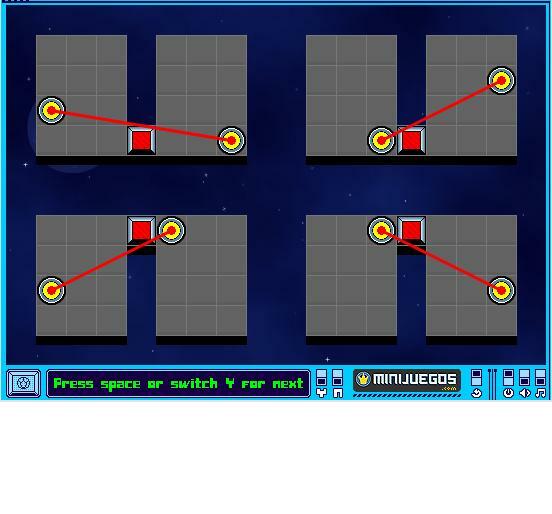 In cases where there is only one movable object in the level, the object to be moved is not specified. Directions are pretty straight forward, D=down, U=up, L=left, R=right. If your route took more steps than mine, you may click the spoiler to see how I improved on your route. If your route took less steps than mine, I'd love to hear how you did it. LS2 D. LS3 UR3. LS4 UL3. LS1 D3R3D. LS2 D2R6. LS5 D2L6. LS6 D3L3D. LS1 R2DRDR2. LS2 L2DLDL2. LS3 R2URUR2. LS4 L2ULUL2. LS2 LD2. LS1 DL8U3. LS3 D3L7D2. LS4 U2R8U3. LS5 UR. LS6 R7D2. LS2 R12DRD3L. LS1 R9. LS4 R9UR3DRD6L4. LS3 R4. LS7 L12ULU4. LS8 L9. LS5 L9DL3U. LS6 L3U9L. LS1 D. LS2 D5R4D3R3. LS3 L2. LS6 R2. LS7 U5L4U3L3. LS8 U.
LS1 LD2. LS2 D7R2. LS3 L2U. LS4 U7R. VW1 D. VW3 D. VW4 D. VW5 U. VW7 U. VW8 U. HW1 R2. HW3 R2. LS1 RD2. LS2 D. LS3 RU2. LS4 U. VLC2 D5. VLC1 D5. VLC3 U5. VLC4 U5. HF1 L7. HF2 R7. LS1 R12. LS2 R2U3R2. LS3 L2D3L11. LS4 L3. LS7 U2. LS8 U2. LS6 L2U6L. LS4 L2U2L12D. LS2 D2RD4L2. LS1 DLD7. LS5 U4R6. LS1 R3. LS2 D5L. LS3 R3. LS4 U11L3. LS2 RD6L3. HLC1 L. HLC4 L. HLC5 R. VLC2 D4. LS2 U2L3. LS1 L4D7R3. LS2 LU5R5. HLC5 L. VLC2 U2. LS1 U3R4U. LS2 U3L4U. LS7 L. LS8 R. LS5 LUL4U5L. LS3 D4R6D2R. LS4 L6D6L. LS6 U5R5UR. LS1 D2. LS2 RD. LS4 D3. LS5 U4R2. LS6 RU. LS7 LU. LS8 U4L2. HF2 L. VF1 D. HF1 L4. LS1 U4R3. VF2 U. HF3 L2. VW1 D4. LS2 U3. LS3 D3. VF3 D. HF4 R2. VW2 U6. HF5 R. VF4 U. HF6 R4. LS4 D4L3. LS1 L2D. LS2 U2. LS3 U4. HW13 L. HW14 R. VW27 D. VW30 D. VW23 D. VW26 D. VW19 D. VW22 D. VW15 D. VW18 D. VW11 D. VW14 D. VW7 D. VW10 D. VW5 D. VW6 D. HW1 L. HW2 L. HW12 R. HW11 R. VW8 U. VW9 U. VW12 U. VW13 U. VW16 U. VW17 U. VW20 U. VW24 U.
HF1 R5. VF1 D. VF2 U6. LS2 L2D2L12. HF1 L11. LS1 R2D2R11. LS2 RU2L2D. HF1 R11. LS1 U2R2D. LS3 U. LS4 U.
LS4 LD3RU7. LS3 RD3L2U8R. LS1 R.
LS1 DR8. LS2 L4DL4. LS3 R. LS4 L. LS5 RU3R5. LS6 LU3L5. HLC1 R. VLC5 D4. VLC3 D4. VLC1 D4. HLC2 L. VLC6 D4. VLC4 D4. VLC2 D4. VW11 U2. HW5 R. VW7 D. HW3 L. VW5 D. VW3 D. HLC5 L2. VW1 D. HLC3 L3. VW1 U. VW3 U. HLC7 L. HLC9 L. VW12 U2. HW6 L. VW8 D. HW4 R. VW6 D. VW4 D. HLC6 R2. VW2 D. HLC4 R3. VW2 U. VW4 U. HLC8 R. HLC10 R.
HF1 L8. HF2 L. HF4 L2. HF6 L3. HF8 L2. HF10 L. LS5 URU8L. LS1 DRD8. LS3 L. LS4 L. LS7 L. LS8 L.
LS2 UL3. LS4 RU3L. LS1 LD3RDR3URU2. LS2 DLD. LS3 R2. LS5 LD3. LS8 RU3LUL3DLD2. LS7 DR3URU. LS5 R. LS6 L2. HW1 L. HW2 R2. HW3 L2. HW4 R. HW7 L. HW8 L. HW9 R. HW10 R. HW13 L. HW14 L. HW15 R. HW16 R. HW19 L. HW20 R2. HW21 L2. HW22 R. HLC3 L. HLC4 L. HLC5 R. HLC6 R. LS1 LUL5. LS8 DL3DL5. LS2 L3U3L. LS3 LD6L. LS4 RU4R. LS5 RD5R3. LS6 RU3R6. LS7 R3D2R6. HF6 L8. VF3 D. HF4 R9. HF3 L8. HF1 R8. VF1 D. LS1 R2U5L2. VF2 U. HF3 L. LS1 RU4LU. HF3 R. VF2 D. LS2 LU5L2. VF2 U. HF3 L. LS2 RU4R2U. LS1 D. LS2 D. LS5 R2U. LS8 L2U3. LS6 D. LS7 U.
LS1 LD10. LS4 RU10. VLC1 D. VLC2 D. HLC5 L. HLC6 L. HLC7 R. VLC5 U. VLC5 U. HLC8 R. VLC6 U.
LS1 D. LS2 D. HF10 R2. HF9 R2. HF11 L4. HF12 L4. HF14 R. HF13 R. HF15 L5. HF16 L5. LS3 URUR. HF14 R2. HF13 R2. LS3 DR. HF10 R2. HF9 R2. LS3 UR. HF14 R2. HF13 R2. LS3 DR3UR. HF16 R2. HF15 R2. LS3 DR. HF12 R2. HF11 R2. LS3 UR. HF16 R2. HF15 R2. LS3 D. HF12 R. LS4 U2. LS3 RD. HF11 R. HF15 L. HF16 L. LS4 LDL. HF11 L2. HF12 L2. LS4 UL. HF15 L2. HF16 L2. LS4 DL. HF11 L. LS4 U. HF15 L. HF16 L. LS4 DL3UL. HF13 L2. HF14 L2. LS4 DL. HF9 L2. HF10 L2. LS4 UL. HF16 R4. LS3 U. HF13 L2. HF14 L2. LS4 DL. LS1 RD. LS2 R2UR. LS3 L2UL. LS4 LD. LS5 UR. LS6 R2DR. LS7 L2DL. LS8 UL. LS2 DL4. LS3 LD10L2. LS4 DR3. LS5 DL3. LS6 RD10R2. LS7 DR4. LS4 DL. LS2 D4RD2L. LS4 RU5RU2L. LS1 UR. LS3 U4LU. LS1 LD5LD. HF8 R3. HF7 R3. HF6 R3. LS2 DL2U. HF6 L2. HF7 L2. HF8 L2. LS2 DL2UL. HF5 L. HF6 L2. HF7 L2. LS2 DL2U. HF5 L2. HF6 L2. HF7 L2. LS2 DL2UL2. LS1 DRDR2U. HF5 L4. HF6 L4. HF7 L4. LS2 DL2U3. HF7 R5. HF6 R5. HF8 L3. LS1 DR2UR. HF8 R3. HF7 R3. HF6 R3. LS1 DR2U. HF8 R2. HF7 R2. HF6 R2. LS1 DR2UR2. HF8 R4. HF7 R4. HF6 R4. LS1 DR2U3. HF4 R3. HF3 R3. HF2 R3. LS4 UL2D. HF2 L2. HF3 L2. HF4 L2. LS4 UL2DL. HF1 L. HF2 L2. HF3 L2. LS4 UL2D. HF1 L2. HF2 L2. HF3 L2. LS4 UL2DL2. LS3 URUR2D. HF1 L4. HF2 L4. HF3 L4. LS4 UL2D3. HF3 R5. HF2 R5. HF4 L3. LS3 UR2DR. HF4 R3. HF3 R3. HF2 R3. LS3 UR2D. HF4 R2. HF3 R2. HF2 R2. LS3 UR2DR2. HF4 R4. HF3 R4. HF2 R4. LS3 UR2D3. LS1 R. LS2 D2. LS7 U2. LS8 L. VLC1 D4. VLC2 D4. VLC3 D2. VLC4 D2. HLC1 R4. LS4 U4L4U. HLC2 R4. VLC3 U. VLC7 D. VLC8 D. VLC12 D2. VLC9 D. VLC10 D. HLC3 L3. VLC13 D. VLC11 D. VLC31 U2. VLC32 U2. VLC33 U4. VLC34 U4. HLC12 L4. LS5 D4R4D. HLC4 R. VLC16 U. HLC5 L. VLC15 D. HLC6 R2. HLC7 L2. HLC8 R. VLC20 U. HLC9 L. VLC19 D. HLC10 R3. VLC22 U. VLC23 U2. HLC11 L4. VLC32 D. VLC24 U. VLC25 U. VLC26 U. VLC27 U. VLC28 U.
LS1 U3. LS2 U4. LS3 L4. LS4 R4. LS5 D4. LS6 D3. LS1 D. LS3 D. LS4 U. LS6 U. VW2 D. VW4 U. VW9 D. VW11 U. HW4 R. HW6 R. HW7 L. HW9 L.
LS1 RU. LS2 LD3R2DRD4L3. LS7 RU3L2ULU4R3. LS6 R. LS3 L. LS8 LD. LS1 ULR. LS URLD. VW1 D2. LS1 LR. VW2 D2. LS1 LR. VW3 D2. LS1 LR. VW4 D2. LS1 LR. VW5 D2. LS1 LR. VW6 D2. LS1 LR. VW7 D2. LS1 LR. VW8 D2. LS1 LR. VW9 D2. LS1 LR. VW10 D2. LS1 LRDL. LS2 RL. LS1 R. VW11 D3. VW12 D3. LS1 LR. LS2 RL. VW10 D. LS2 RL. VW9 D. LS2 RL. VW8 D. LS2 RL. VW7 D. LS2 RL. VW6 D. LS2 RL. VW5 D. LS2 RL. VW4 D. LS2 RL. VW3 D. LS2 RL. VW2 D. LS2 RL. VW1 D. LS2 RL. LS3 L. VW13 U3. LS3 RL. LS4 R. VW24 U3. LS4 LR. HW6 R3. HW7 L3. HW11 R2. HW10 R. HW12 L2. LW13 L. HW17 R2. HW16 R. HW18 L2. HW19 L. HW20 R. HW21 L. VW3 D3. VW1 D3. VW4 D3. VW2 D3. VW5 U3. VW7 U3. VW6 U3. VW8 U3. LS1 LU4R8. LS2 RU4L8. LS3 LD4R8. LS4 RD4L8. HLC2 R2. HLC1 R2. HLC3 L2. HLC4 L2. HLC6 R3. HLC5 R3. HLC7 L3. HLC8 L3. HLC10 R2. HLC9 R2. HLC11 L2. HLC12 L2. HLC14 R. HLC13 R. HLC 15 L. HLC16 L. HLC18 R. HLC17 R. HLC19 L. HLC20 L. HLC22 R2. HLC21 R2. HLC23 L2. HLC24 L2. HLC26 R3. HLC25 R3. HLC27 L3. HLC28 L3. HLC30 R2. HLC29 R2. HLC31 L2. HLC32 L2. LS1 R2. LS2 DLDLDLDLD3R2. LS3 UL. LS7 URURURURU3L2. LS4 LU3L2U2L3D2L2DL. LS5 RD3R2D2R3U2R2UR. LS6 DR. LS8 L2. HW1 R. HW5 R. HW2 R. HW6 R. HW3 L. HW7 L. HW4 L. HW8 L. HW9 R. HW13 R. HW10 R. HW14 R. HW11 L. HW15 L. HW12 L. HW16 L. VW2 U2. LS1 DRD. VW1 U2. VW13 U2. LS1 LD. V25 U2. LS2 DRD. VW4 U2. VW16 U2. LS2 LD. HW6 L. VW6 U. VW17 U. VW18 U. LS2 R. VW8 U2. LS3 DLD. VW9 U2. VW21 U2. LS3 RD. HW7 R. VW7 U. VW19 U. VW20 U. LS3 L. VW11 U2. LS4 DLD. VW12 U2. VW24 U2. LS4 RD. VW38 D2. LS5 URU. VW37 D2. VW25 D2. LS5 L. VW26 D. VW41 D2. LS6 URU. VW40 D2. VW28 D2. LS6 LU. VW29 D. VW44 D2. LS7 ULU. VW45 D2. VW33 D2. LS7 RU. VW32 D. VW47 D2. LS8 ULU. VW48 D2. VW36 D2. LS8 R. VW35 D.
LS1 D. LS2 D4. LS4 R4D3. LS6 U3LU7L5. LS3 R. LS5 D4R3. LS7 R4. LS8 L3UL7U5. VW9 D. VW10 D. HW12 L2. HW13 L2. VW5 D2. VW3 D2. HW10 L. HW11 R. HW7 R. HW19 R. HW23 R. LS2 D11. VW17 U. VW18 U. LS1 RD5L4. VW22 D. VW26 U2. HW4 L. HW8 L. VW23 U. VW24 U. HW15 R2. HW14 R2. VW28 U2. VW30 U2. HW16 L. HW20 L. HW17 R. LS3 U11. VW17 D. VW18 D. LS2 LU5R4. VW7 D2. VW11 U.
VF2 D6. VF4 U4. HF7 R13. HF8 L3. HF6 L3. HF4 L3. LS2 L2U2LU2RU. VF2 U2. VF4 U2. LS2 LU. VF1 D4. VF3 U6. HF1 R3. HF2 L13. HF3 R3. HF5 R3. HF7 L9. LS1 R2D2RD2LD. VF3 D2. VF1 D2. LS1 RD2. HF2 R9. LS2 U.
VLC1 D3. VLC2 D3. VLC3 D3. VLC10 D5. VLC27 U5. HLC7 L7. HLC10 R7. VLC11 D4. VLC26 U4. VLC12 D3. VLC16 D6. VLC17 D6. VLC18 D6. HLC16 L6. VLC13 D6. VLC14 D6. VLC15 D6. VLC4 D3. VLC5 D3. VLC6 D3. VLC7 D3. VLC8 D3. VLC9 D3. VLC19 U6. VLC20 U6. VLC21 U6. VLC23 U6. VLC24 U6. VLC25 U6. HLC15 R4. HLC14 R4. HLC13 R4. VLC22 U3. VLC28 U3. VLC29 U3. VLC30 U3. VLC31 U3. VLC32 U3. VLC33 U3. VLC34 U3. VLC35 U3. VLC36 U3. HLC1 R3. HLC2 L3. HLC3 L3. HLC4 L3. HLC6 R6. HLC5 R6. HLC8 L6. HLC9 R6. HLC11 L6. HLC12 L6. LS1 L2D10R4. LS2 L2. LS3 R. LS4 RD7L2. LS5 D3R4. LS6 L4. HW1 R. LS1 D2. HW1 L. HW2 L. LS2 D2. HW2 R. HF2 L2. HF6 L. HF7 R. VF1 D. VF2 D. HF3 L4. HF4 L6. HF5 R3. LS1 RURU2LUL4D2LDLD3. VW3 U. VW4 U. HF10 R. HF9 R2. VF6 U. LS4 DR2U. HF10 R. VF6 D. HF9 R2. LS4 DRD. HF9 L2. VF6 U. HF10 L. LS3 RDR2U. HF10 R4. HF4 R6. HF3 R6. HF2 R6. HF1 R6. HF8 L3. LS4 R3U2RU6LULU2L4DL2D2. LS2 LULU2RUR4D2RDRD3. LS2 DRD9L2. LS7 R. HLC5 L. HLC6 L. HLC11 L2. VLC6 U3. HLC6 R. HLC5 R. LS6 DLD3. LS8 D. VLC5 U. HLC17 L2. HLC23 L. HLC29 L. HLC30 L. VLC10 D3. HLC30 R. HLC29 R. LS4 URU9L3. LS3 UL. LS5 URU6. HLC3 R. HLC2 R. HLC7 R2. VLC3 U3. VLC4 U. HLC2 L. HLC3 L. HLC16 R2. HLC22 R. HLC27 R. HLC26 R. VLC7 D3. HLC26 L. HLC27 L. VLC2 D. HLC10 L. VLC1 D3. VLC11 U3. HLC28 R. VLC12 U. HLC32 R2. 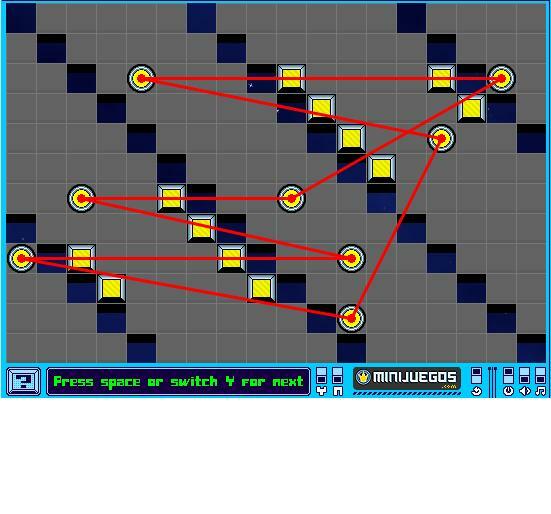 I did not write down my routes for some levels because I haven't optimized them yet. VW3 U. VW10 D. LS6 U2LU2RU3LU3. LS2 D2LD2RD3LD2RD. VW9 D. LS1 D2RD2LD3RD3. LS7 U2RU2LU3RU2LU. LS3 D7R4D3. LS4 U7L4U3. HLC10 L2. VLC6 D. HLC5 L. HLC6 L. VLC8 U. HLC11 L2. VLC12 U. HLC9 R2. VLC9 U. HLC14 R. HLC13 R. VLC7 D. HLC8 R2. VLC3 D. LS1 LUL2. LS2 D5RDR2. LS1 DR3U3. LS2 URULDLD2R2U. LS3 ULUR2D3L7. LS2 DR5. LS4 DL2U2LU. LS1 U. LS2 UL2. LS3 D4. LS4 L9D3. LS3 DR10. LS4 D.
LS1 D. LS2 R2. LS3 D. LS4 R2. LS5 L2. LS6 U. LS7 L2. LS8 U. VLC6 U2. HLC2 R. VLC5 U. VLC1 D2. HLC2 L. HLC4 L. HLC6 L. HLC9 R. HLC11 R2. VLC9 D2. HLC10 L. VLC10 D.
VW1 U. VW2 U. VW3 D. VW4 D. LS1 L4. LS2 R3. LS3 L4. LS4 R3. VW1 D. HW1 L. HW4 R. VW4 U. LS1 UR10D3R. LS2 UL10D4L. LS3 DR10U6. LS4 DL2. HLC3 L2. HLC8 L. VLC4 U. VLC5 U. HLC9 L. VLC7 D. VLC8 U2. HLC6 L. HLC10 L.
LS2 D5R. LS3 R3D11. LS4 L4. LS5 LU6. LS6 U11L. LS3 R3UR5U. LS1 D3R2. LS4 D4L4D2L. LS2 D2. LS5 RU2. LS6 L4DL12D. LS7 UR9U9. LS8 U4. LS7 R2. LS8 LUL9DL2. LS7 L2. LS2 D. LS1 R3DR7UR3. LS6 U2. LS4 LD9R. LS6 LU7R. LS3 D2. LS5 RU9LU. LS7 L. LS1 R. LS7 R3UR7DR2. LS1 R3DRDRDUL4DR4UL3DR3L2D2U2L2D4LD. LS3 U. LS1 R3. LS3 D4. LS1 L. LS4 R3. LS3 U5. LS4 L2. LS3 D. LS1 L2. LS2 D. LS4 RL. LS2 U.
VF5 U3. VF7 U5. LS1 RD2R. VF6 U. VF7 D. VF5 D. LS1 LD. VF3 D. VF1 D3. VF2 D3. VF4 D. HF1 R4. HF2 L6. LS1 R2DRD. HF2 R. HF1 R. LS1 UR. HF3 R. LS1 D. HF2 R. HF1 R. LS1 URU. HF2 R4. HF1 R4. HF3 R5. VF8 U3. LS1 R2DR2DR. HF2 R. LS1 UR2. VF6 U2. VF8 U2. VF4 U. LS2 LD2L. VF8 D. VF6 D. LS2 RD. VF4 D. HF1 L4. HF2 L5. HF3 L5. LS2 L2DLD. HF1 L. HF2 L. LS2 UL. HF3 L. LS2 D. HF1 L. HF2 L. LS2 ULU. HF1 L4. HF2 L4. HF3 L5. VF7 D. VF5 D. LS2 L2DL2DL. VF1 L. LS2 UL2. LS3 R. LS4 L. HLC6 R. HLC5 R. HLC7 L. HLC8 L.
HW2 L3. HW4 L3. HW5 L2. LS2 R. LS1 D4R3U. HW6 L2. LS1 U8R2D. HW1 L3. LS2 LD7L4. HW5 R3. LS2 U8L. In other words, the better your solution is, the less you can benefit from finding more improvements. I tried creating an account but it wouldn't let me login with my new account, so I have to post anonymously. Since I last posted here, I have cleared the game, gotten the highest score ever, and then surpassed my own high score. 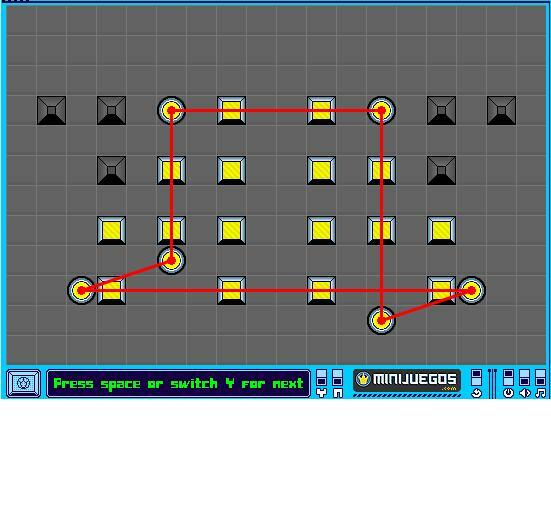 I also have taken screen shots of my solutions to every level, which are available upon request. I am willing to post some of my solutions here, but I'll start by revising the score formula I posted earlier. 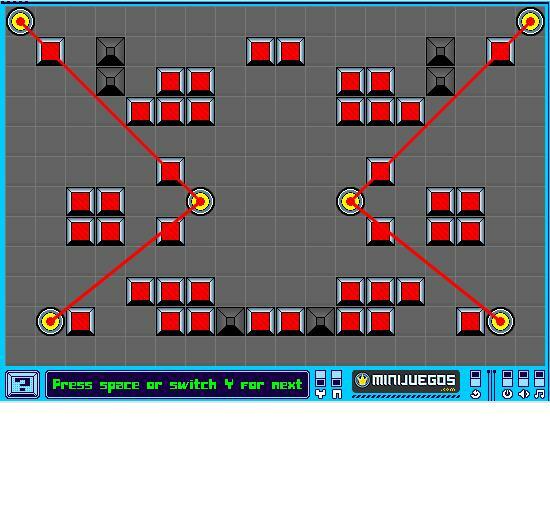 I find that getting a high score in any game (Laserworx is no exception) requires a good understanding of how the scoring system works. 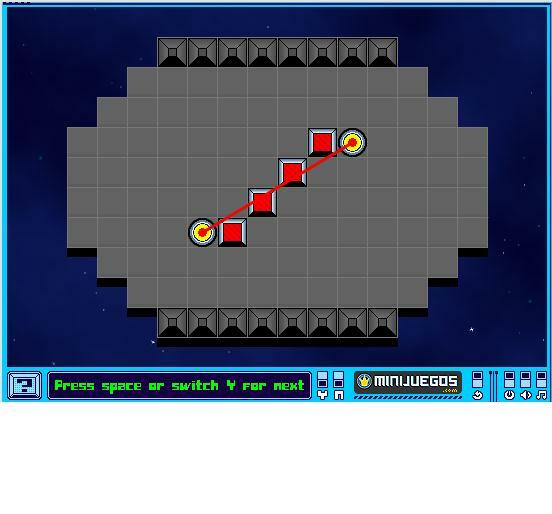 Where n is the level number and s is the remaining steps. Using this formula, the highest score you would get if you could solve every level in a single step (which is impossible, of course) is 351374. My score as of this writing is 336888. 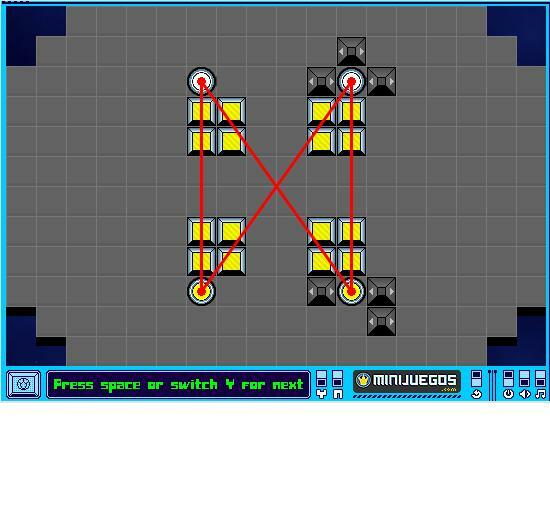 Also, moving vertical anti-lasercells doesn't count, so particularly in levels 60 and 90, you should look for solutions that make use of this unusual behaviour. 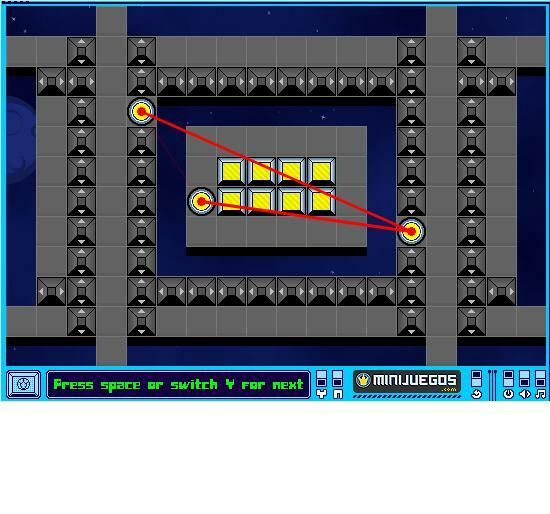 Also, in levels like level 56, a vertical anti-lasercell can't be the last thing you move. I would also like to thank OseeAsi (a.k.a. o_see_as_i?) for his screen shots. They were helpful to me in levels 11, 16, 21, 25, 49, 54, 71, 82, 84, 96, and 100. They were also entertaining sometimes. I had a good laugh when I saw OseeAsi's solution to level 52. 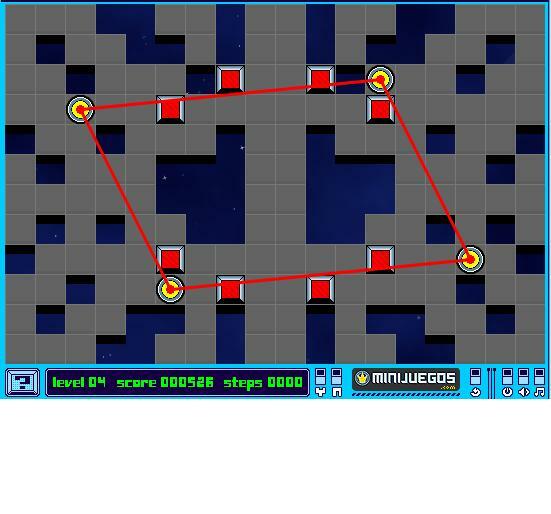 I was not able to see OseeAsi's screen shot for level 73, but it must have been different from my solution because he describes it as being like a Star of David, whereas mine has 2 triangles that don't intersect each other at all. 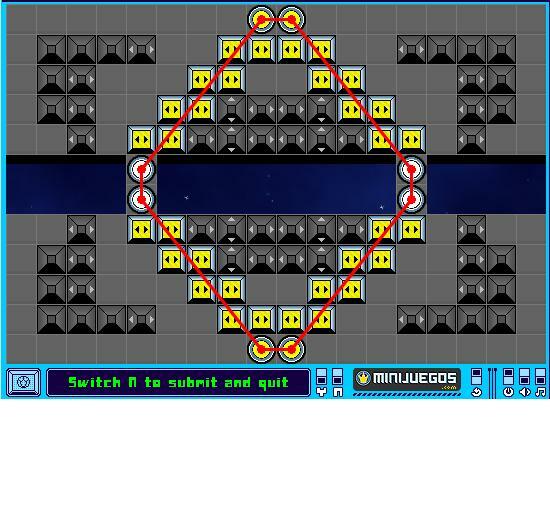 In fact, just to test the idea out, I tried to make a Star of David work in this level, but I just can't. For those of you who are trying for a high score, simply knowing a certain score is possible may help you to get there. So, for your benefit, and also to prove that my score is legit, the "spoiler" below lists my remaining steps in each level, with a brief note on each level. Enjoy! Level 1 - 95 steps remaining. 5 steps to solve. Level 2 - 102. For every step you take, you should be asking yourself, "Is this step really necessary?" 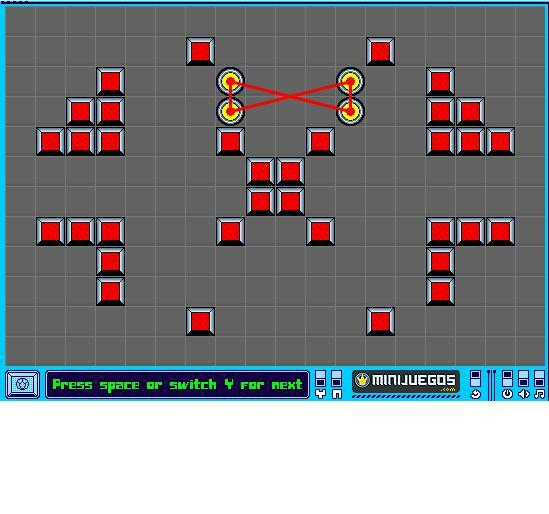 Level 3 - 90. Simple geometry. 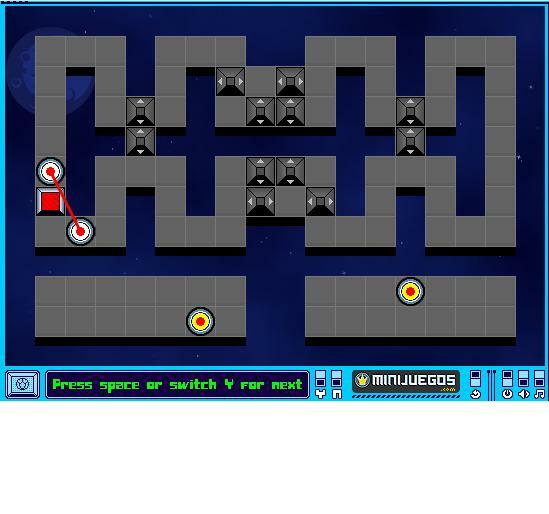 Level 4 - 109. Not exactly a "rhombus", as the hint suggests. 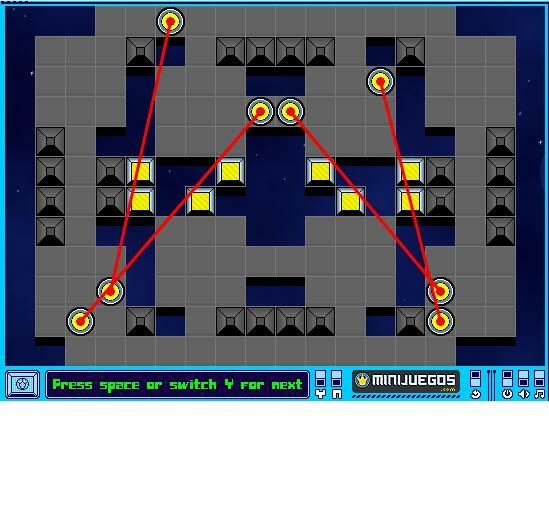 Level 5 - 89. Pay attention to the hint. 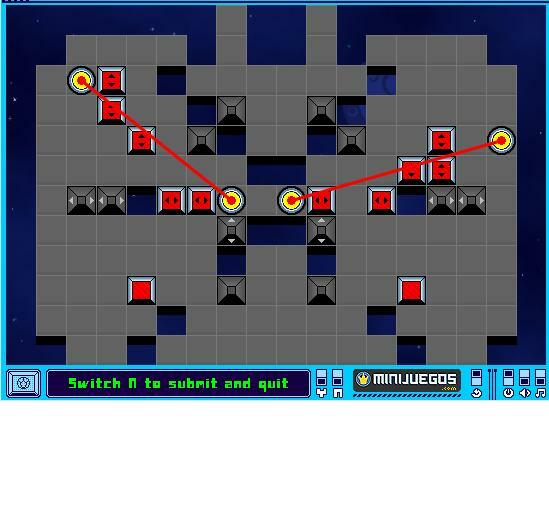 Level 6 - 40. 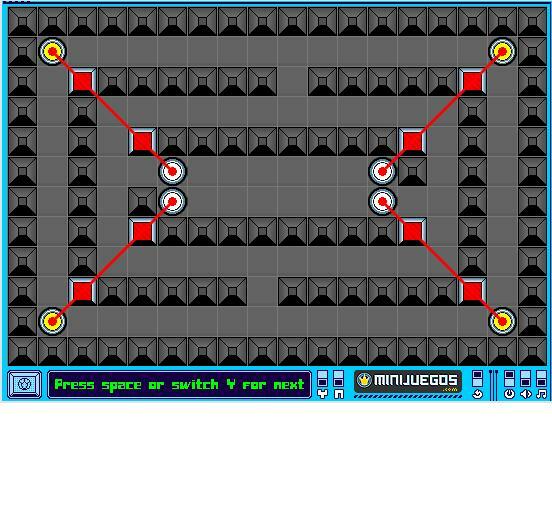 The only level that leaves you with less than 90 steps remaining at the end. Level 7 - 124. 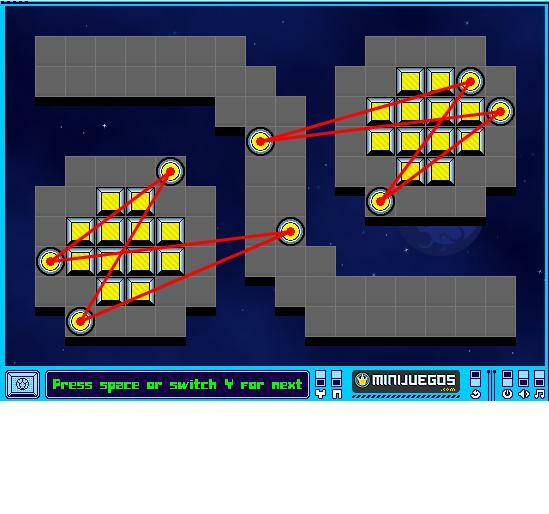 All the laserspots are movable, but you can't move them past the sky. 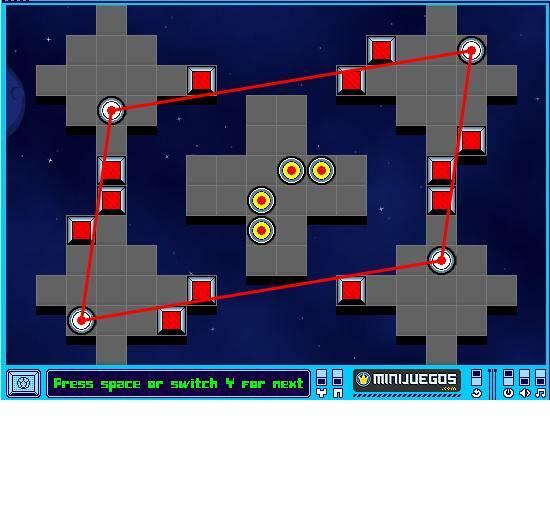 Level 8 - 147. Make the lasers look like a bow tie. Level 10 - 138. Very straight forward. 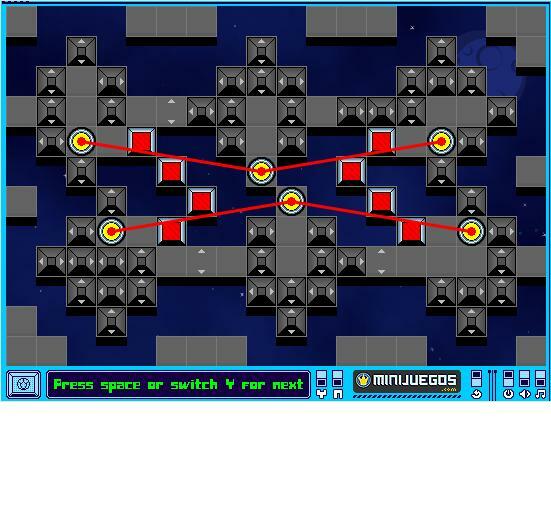 Level 11 - 162. 2 crosses is all you need. 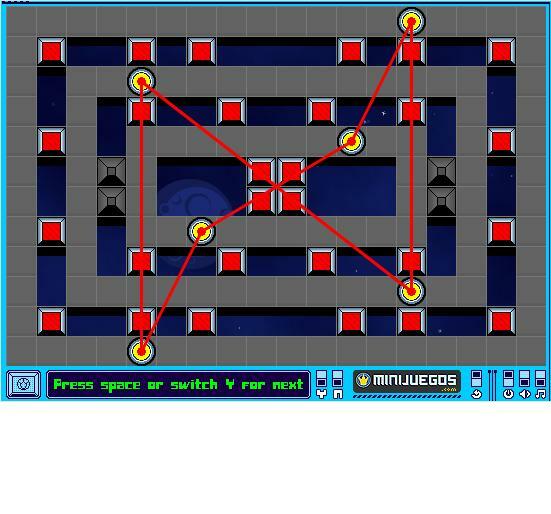 Level 12 - 199. There are 2 ways to solve this, one better than the other. 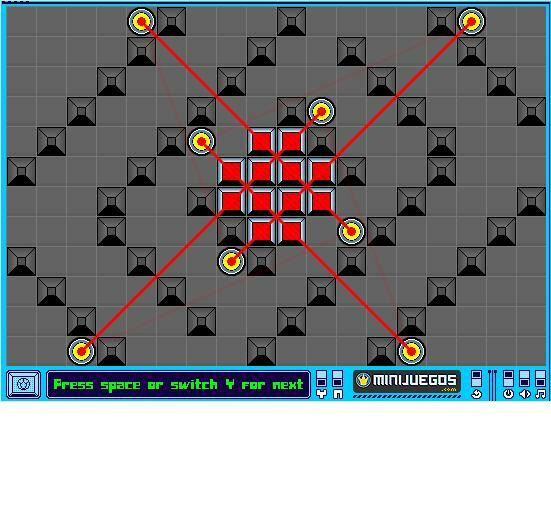 Level 13 - 184. Do you recall Dr. Seuss's story about the Zax? 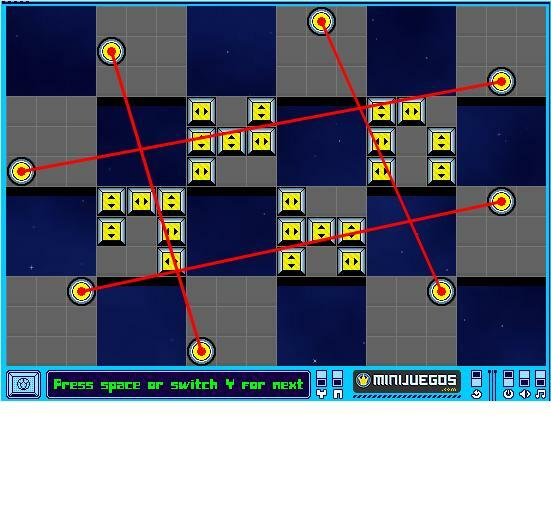 Level 14 - 190. The laserspots don't get in each other's way. Level 15 - 172. 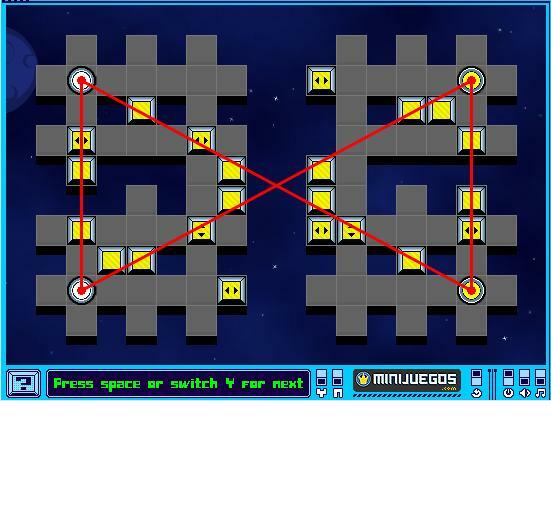 There are multiple ways to arrange the laserspots to solve this level. I tried them all out to see which was fastest. 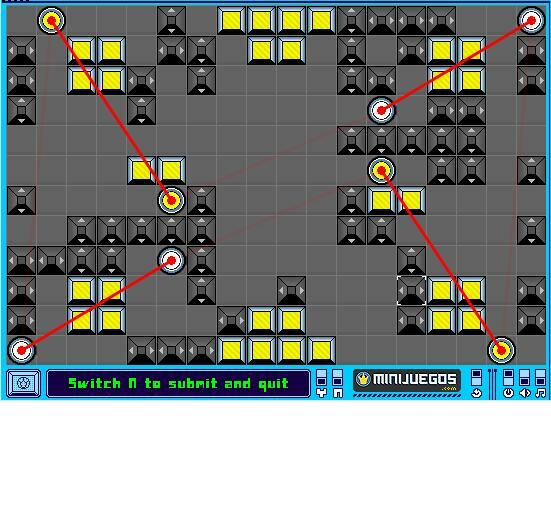 I used a similar strategy in levels 32, 43, 84, and 100. 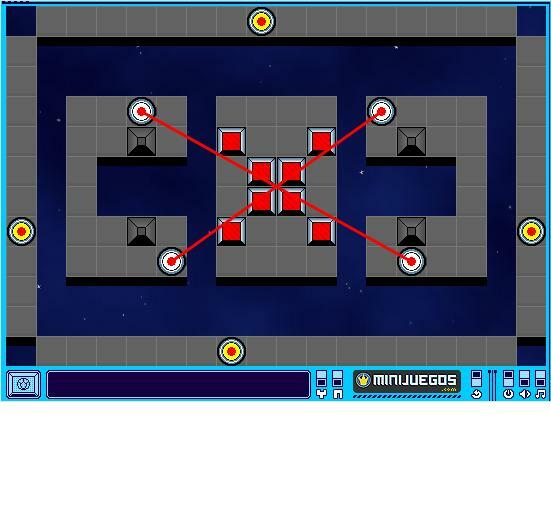 Level 16 - 233. If you make a mistake, don't worry. This level has room for error. 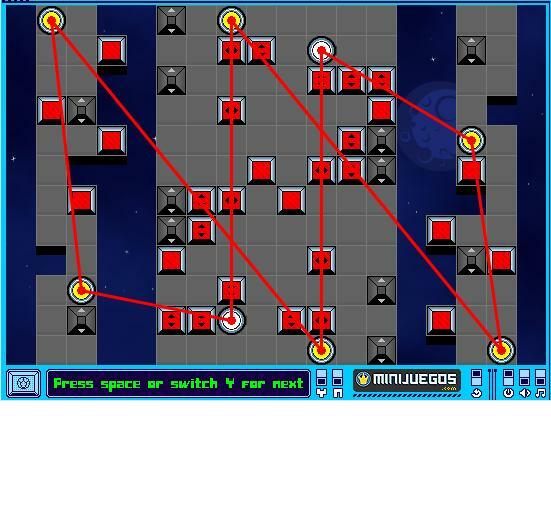 Level 17 - 212. Pay attention to the movable floors here. 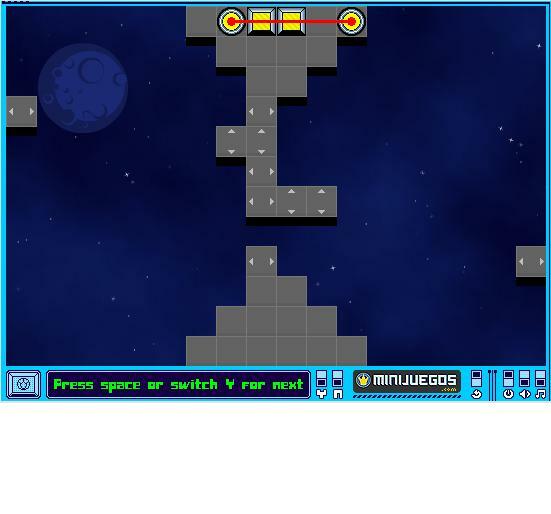 Level 18 - 233. 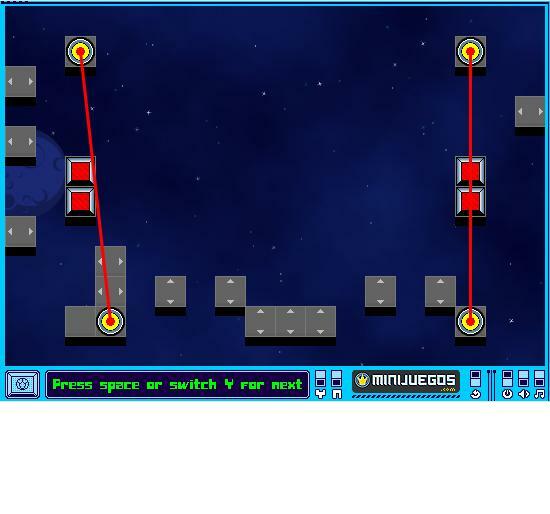 This level has as much room for error as level 16. 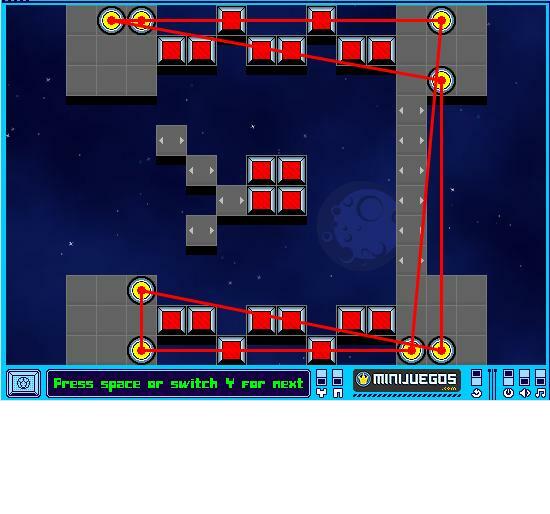 Level 19 - 202. 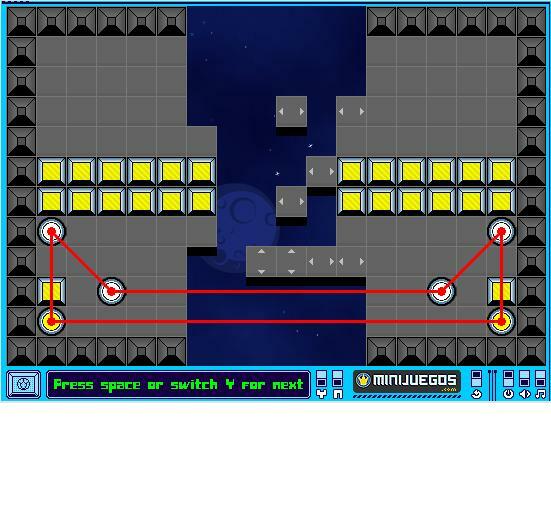 This level has no room for error, so pay attention to which side the movable floor is closer to. Level 20 - 263. 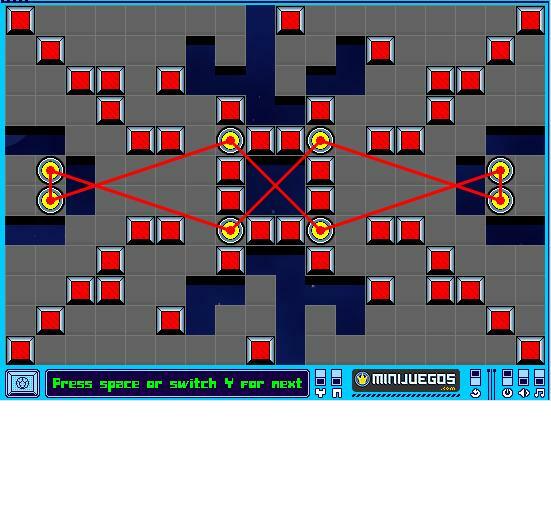 Notice that the single anti-lasercells are not horizontally symmetrical. 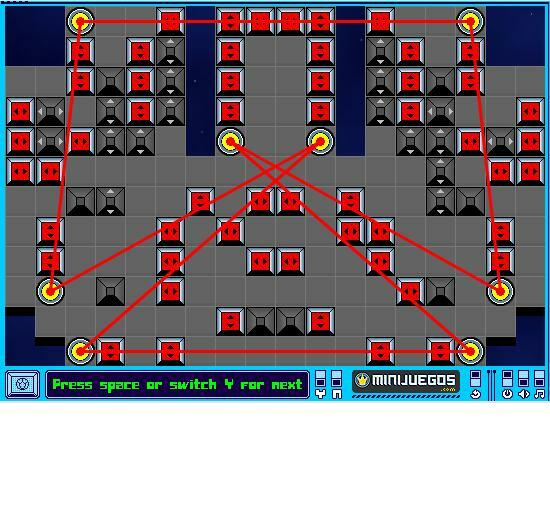 Level 21 - 266. Slightly counter-intuitive, but not impossible if you spend enough time thinking about it. Level 22 - 250. This is not a glitch in the program. You're not supposed to be able to move the laserspots here. Level 23 - 278. The solution is not symmetrical. Level 24 - 318. 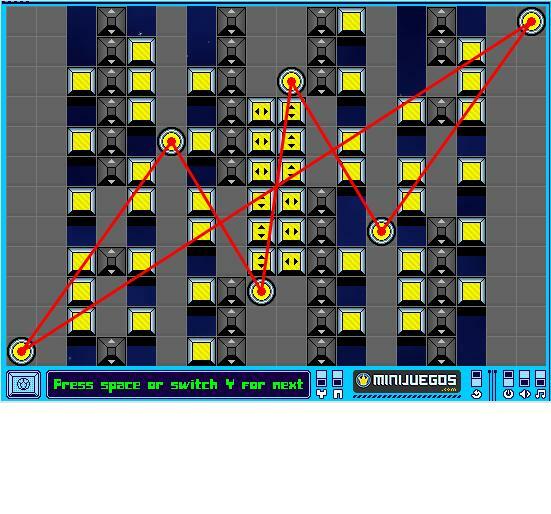 Give yourself a pat on the back if you can figure out how to get 318 here. Level 25 - 303. You must give in order to get. Level 26 - 262. Choose carefully which laserspots go up and which ones go down. Level 27 - 288. 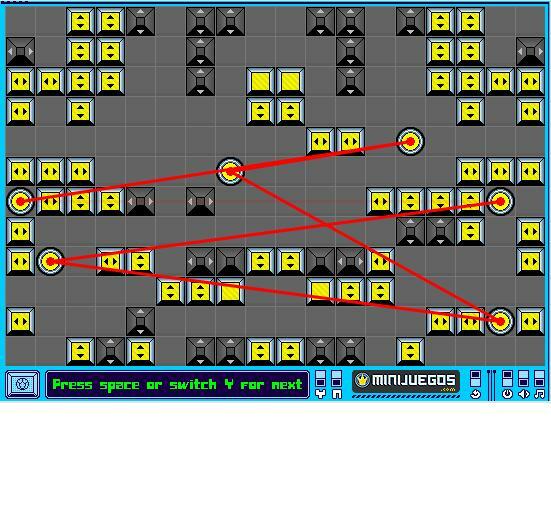 Don't try to optimize levels 30, 45, 58, 63, 69, 75, or 88 until you've optimized this level. Level 28 - 358. 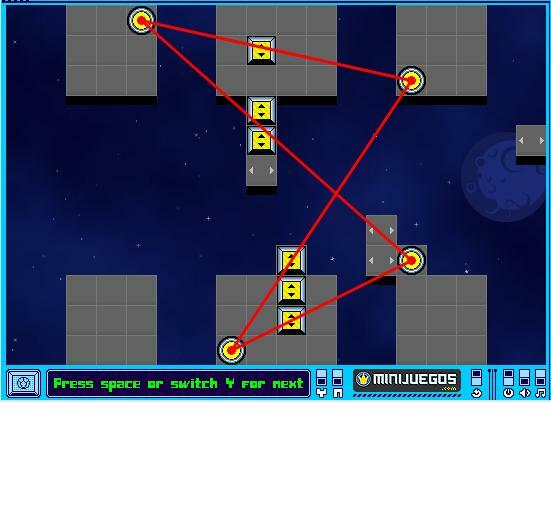 2 laserspots don't move and 4 move only 1 space. Level 29 - 350. You only need to move 2 of the laserspots. Level 30 - 269. Try to get fancy here. Just because a solution is simpler doesn't mean it's faster. 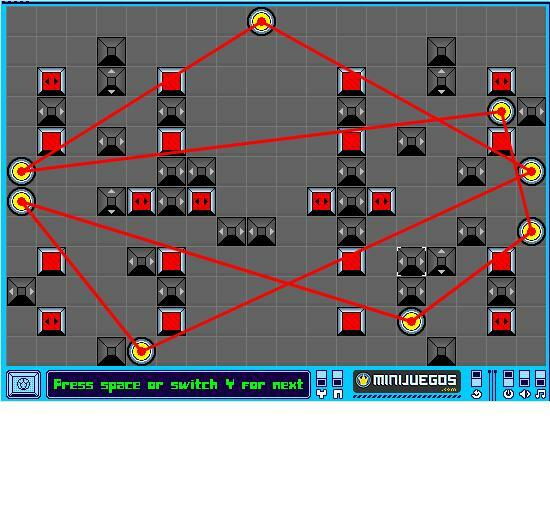 Level 31 - 376. There are 2 ways to solve this, both equally good. Level 32 - 366. No need to move walls here. Level 33 - 124. 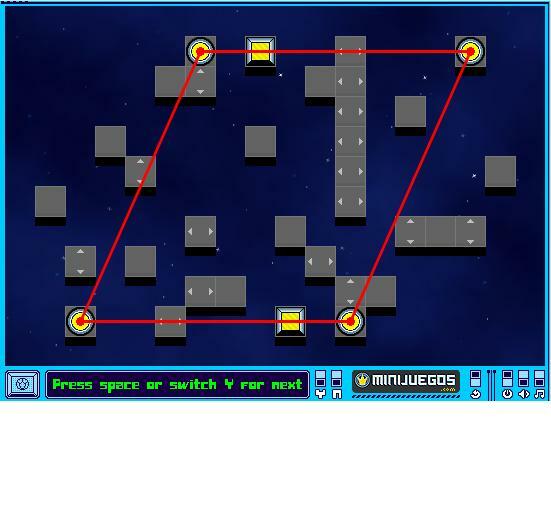 The second most time consuming level, with little room for error. Level 34 - 318. Ditto level 32. Level 35 - 346. A lot of movable parts, yet quite easy to figure out. Level 36 - 428. Well, if you've seen OseeAsi's screen shot, I guess you don't need further hints from me here. Level 37 - 448. Only some of the walls need to be moved. Level 38 - 434. The 434 should be hint enough. 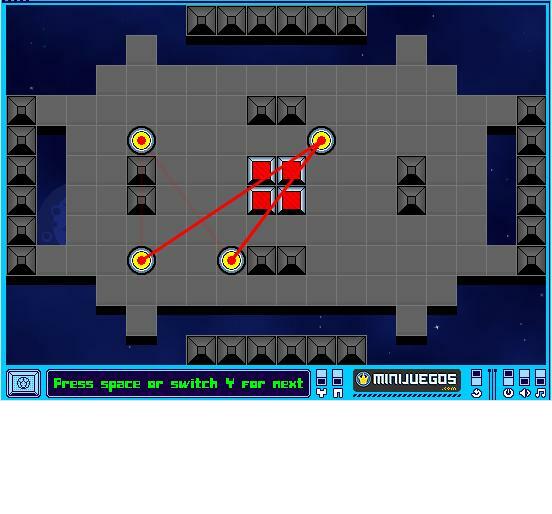 Level 39 - 376. Make sure the laserspots don't get in each other's way. Level 40 - 338. You already know where to put the laserspots and lasercells. The trick is to find the best place for the walls. Level 41 - 432. It should be obvious which solution is best here. Level 42 - 400. You have some room for error here, so if you don't see the 400 solution right away, it's okay. Level 43 - 464. 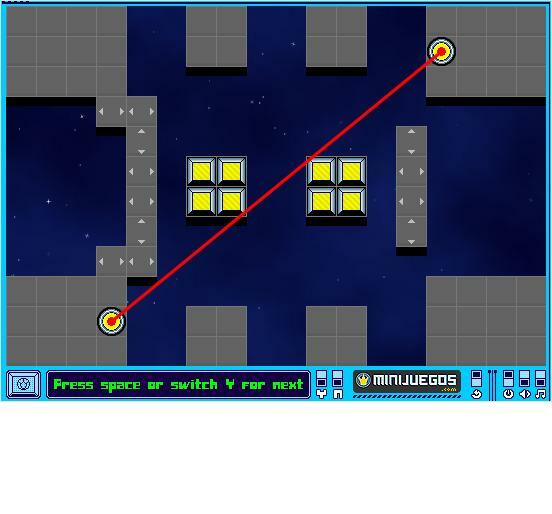 In each section, you must move at least one laserspot a long distance. Level 44 - 448. You wouldn't wait for the light to turn red before crossing the street, would you? Level 45 - 446. Each side can be solved independently. 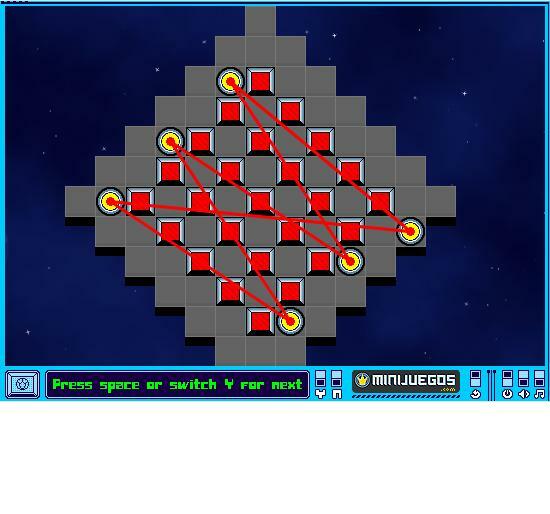 Level 46 - 320. A lot of work, but a simple solution. 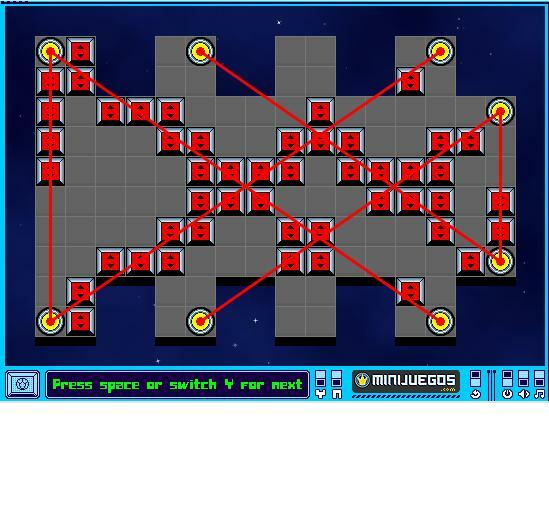 Level 47 - 519. A triple knot! Level 48 - 428. Not all movable floors are needed on both sides. 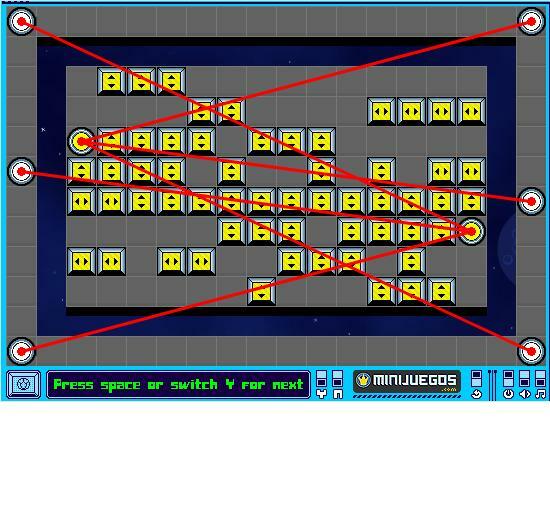 Level 49 - 501. There are so many variables here, it's hard to find the best solution. Level 50 - 498. 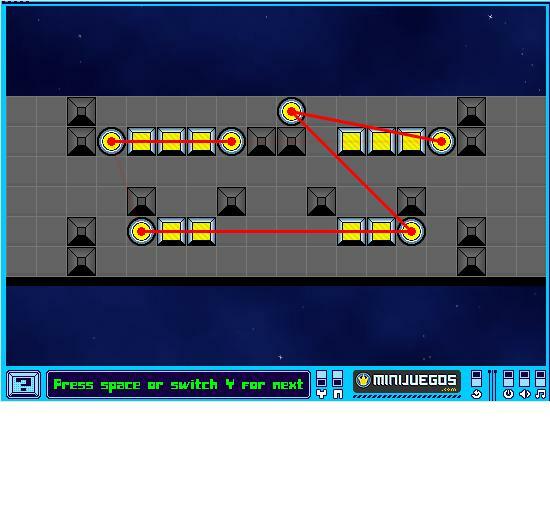 The way the lasercells are arranged is deceptive. Level 51 - 564. Looks can be deceiving here too. 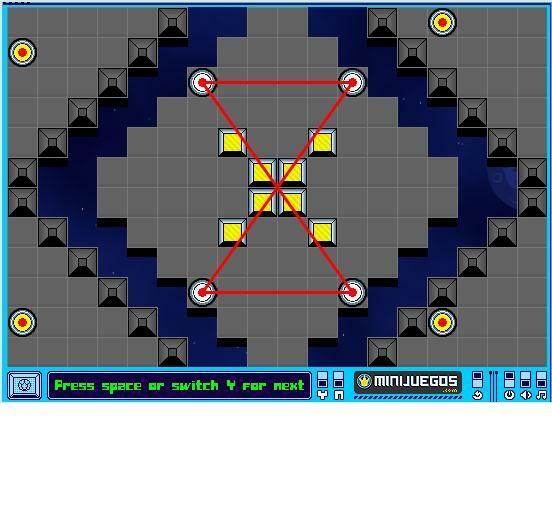 Is the level REALLY symmetrical? Level 52 - 526. Not as much work as you'd think. Level 53 - 524. It's a remote control race car! Level 54 - 568. Remember that trick you learned in level 35? Level 55 - 610. They travel together, but they can't decide on a leader! Level 56 - 625. 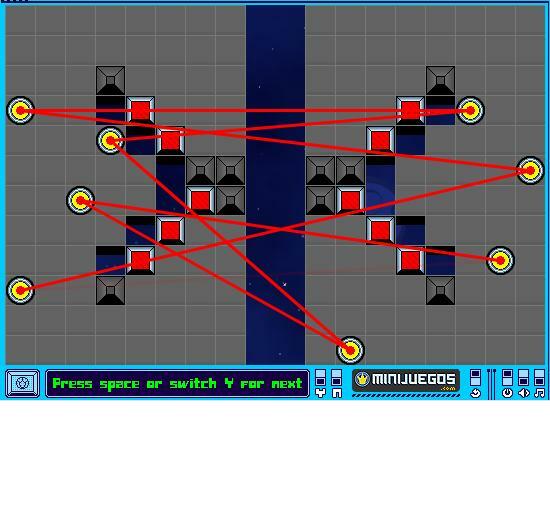 Move the anti-lasercells first and then move the laserspots. 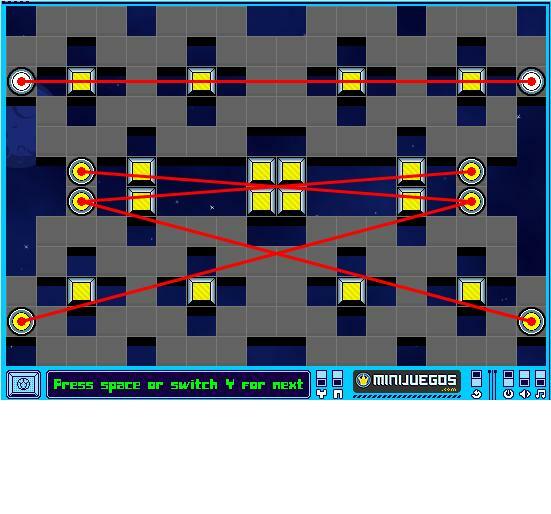 Level 57 - 614. Remember the trick you learned in level 50? 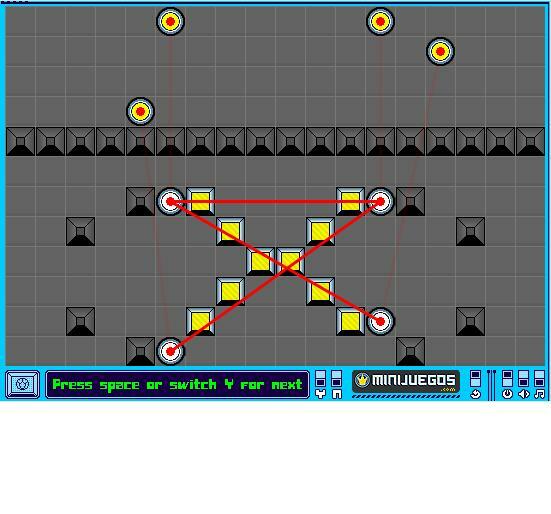 Level 58 - 503. Took me a while to optimize this one. You can save steps if things don't have to move out of the way so much. 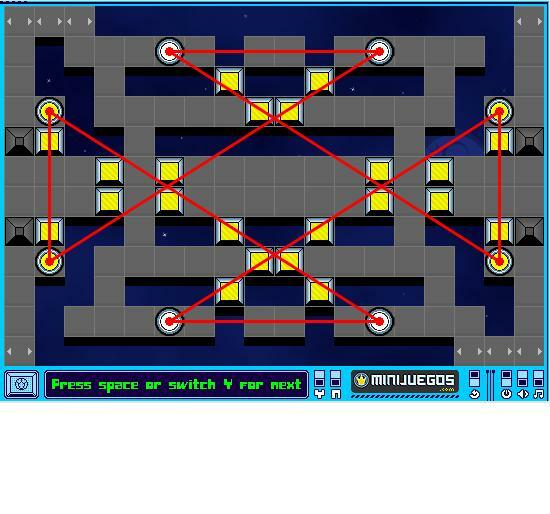 Level 59 - 636. Looks like a square dance gone wrong. Level 60 - 601. Remember, you don't get penalized for moving vertical anti-lasercells. Level 61 - 660. Marionettes! Level 62 - 664. 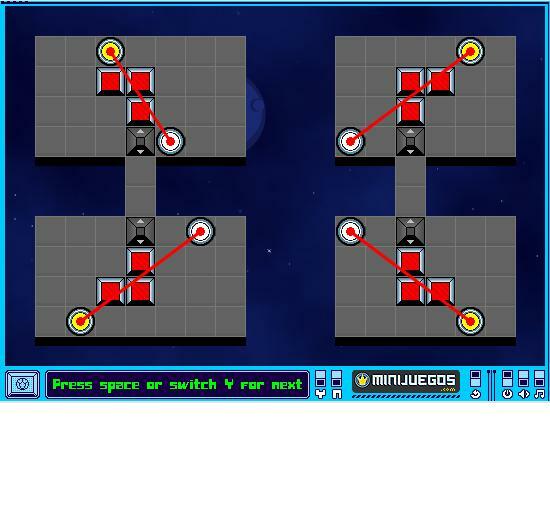 2 of the laserspots don't have to be moved, and 3 of them only have to be moved once. Level 63 - 613. You can save time if the laserspots travel together. 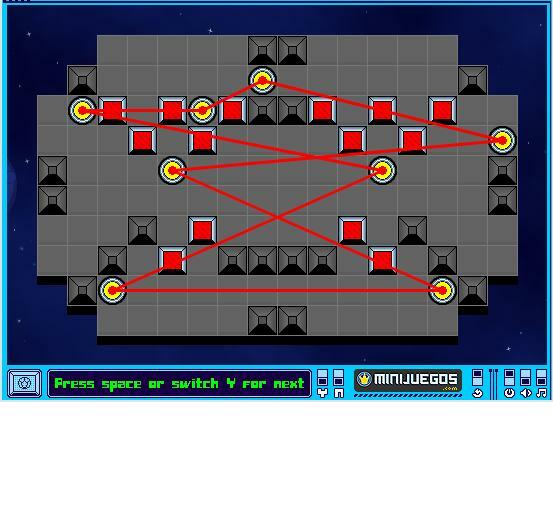 Level 64 - 698. There are 4 ways to solve this, one better than the others. Level 65 - 177. 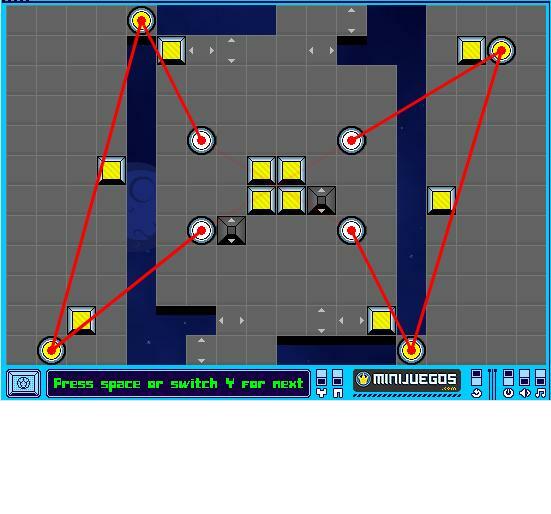 Only 5 of the laserspots need to be moved. Level 66 - 732. A curiosity of game logic that I never understood. 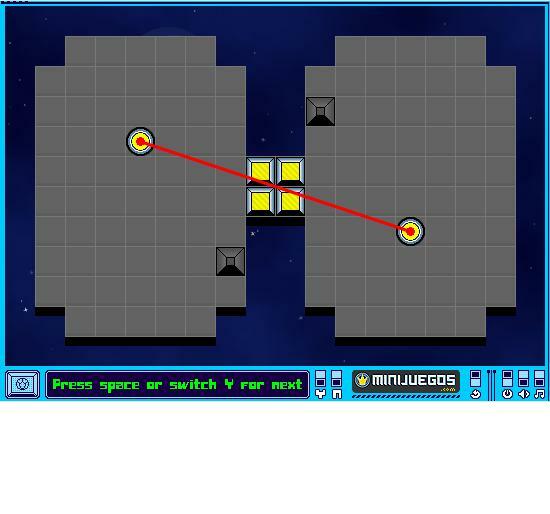 The level can only be solved if the right laserspot is 3 tiles below the left one. Level 67 - 678. The laserspots obviously have to pass each other. How can you do this without annoying one of them too much? Level 68 - 736. You can't form a perfect diamond, but you can get close enough. Level 69 - 693. 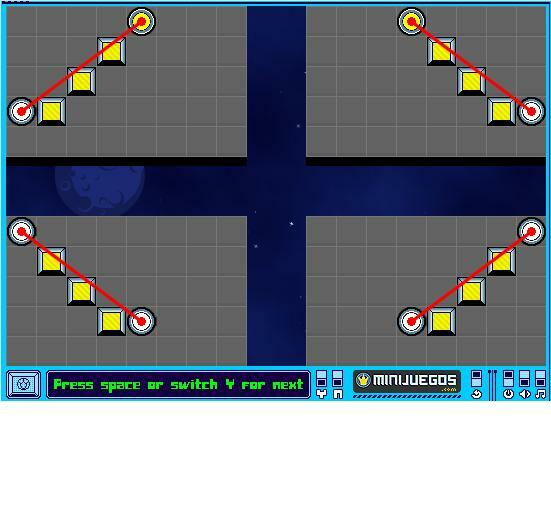 Remember the trick you learned in level 58? Now do the same trick sideways. Level 70 - 757. 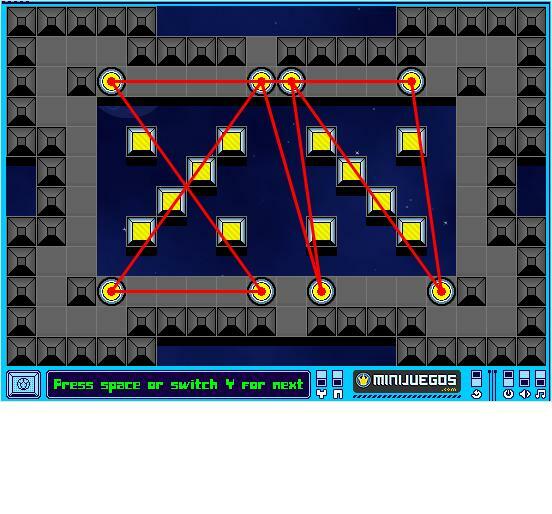 For this level, you must understand that when you move a laserspot that controls other laserspots, the one you move moves first, but the others may move in an order you don't expect. Level 71 - 699. There are multiple ways to solve this. Pick one that doesn't require you to move as many walls. Level 72 - 136. The solution doesn't have to be symmetrical. Level 73 - 649. The laserspots don't have to get in each other's way. Level 74 - 798. Every step must take the laserspots closer to their final destination. Level 75 - 713. Don't waste step moving the floors out of the way. 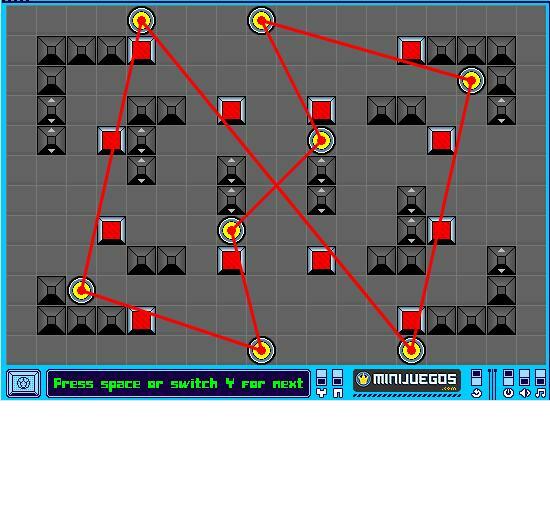 Level 76 - 832. Too easy to be #76. 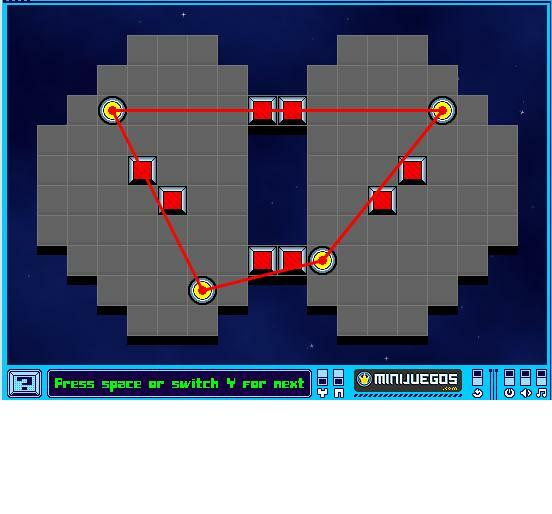 Level 77 - 777. You will definitely have to move the lasercells around. 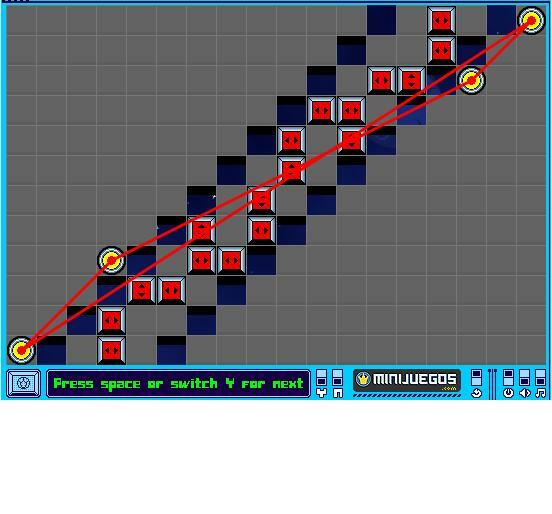 Level 78 - 808. Only 2 of the walls will have to be moved. 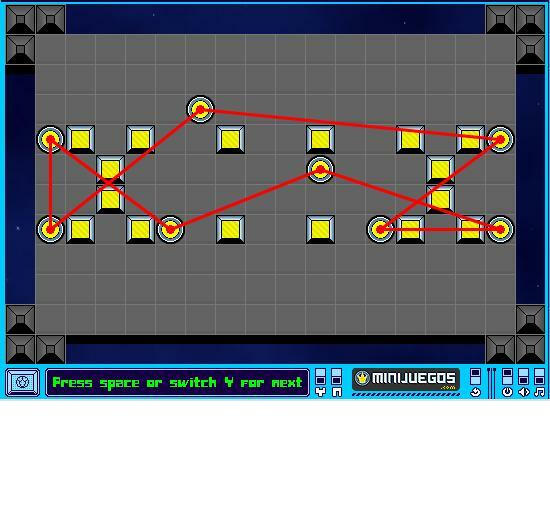 Level 79 - 818. There are many possible solutions, but only 1 that gets 818. There's no room for error. Level 80 - 850. 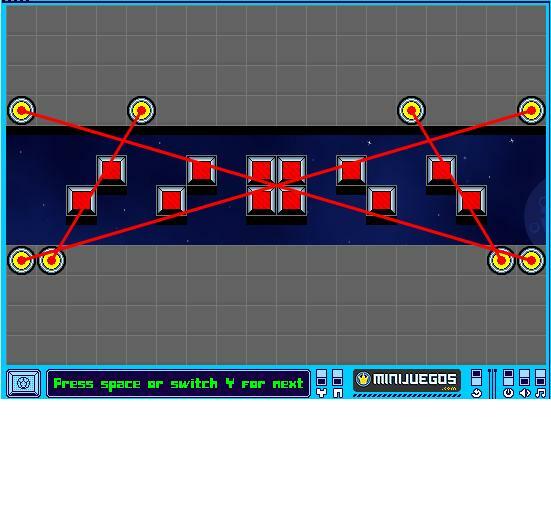 If you arrange the laserspots correctly, you will only have to move 2 of the lasercells. Level 81 - 857. Looks like a butterfly! Level 82 - 804. My solution might not be the one intended by the level designer. Level 83 - 777. This one was hard to figure out and could possibly not be the best solution! Level 84 - 870. 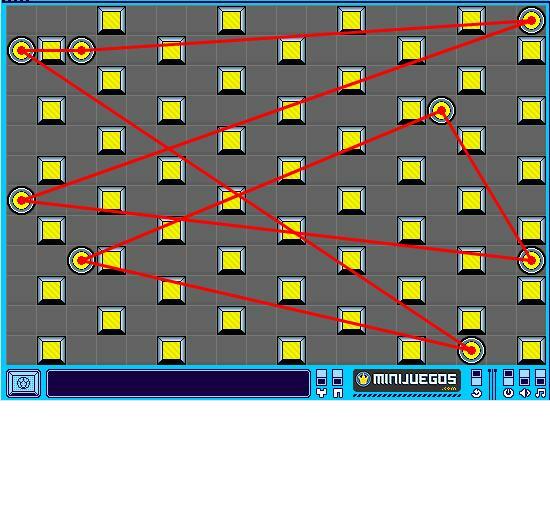 There's more than one arrangement of laserspots that works, but only one that gets 870. Level 85 - 182. It's a similar strategy to what you did in level 61. Level 86 - 834. Give yourself a treat if you can match my 834. 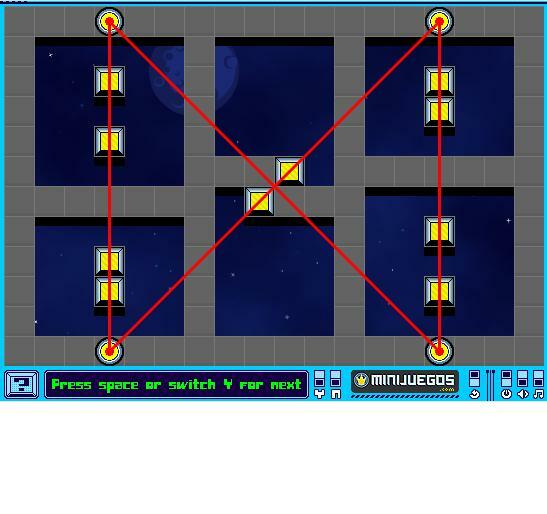 This is a tricky solution to a sticky level. Level 87 - 937. Take note of what each laserspot does before you move any of them. 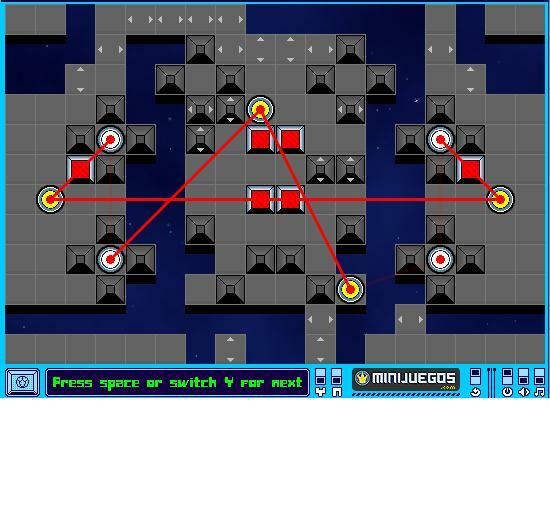 Level 88 - 816. A different solution from the one in OseeAsi's screen shot. Level 89 - 935. There is an easy solution, but there is also a faster one. Level 90 - 834. I tried a lot of different routes before I came up with 834. 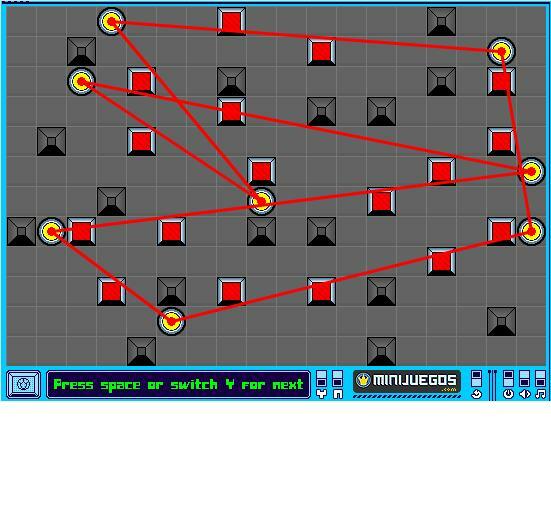 Level 91 - 956. 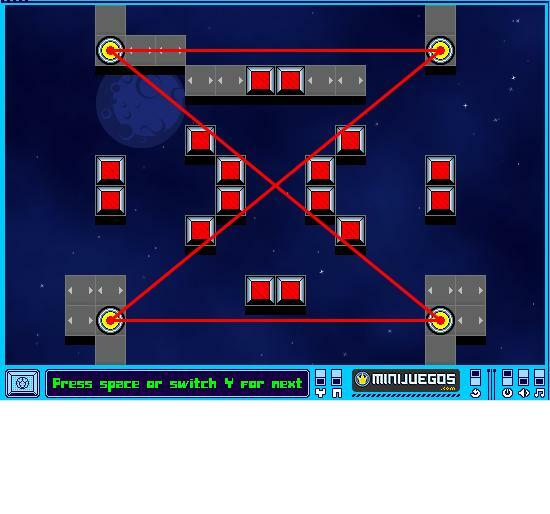 This level had me stumped for the longest time, yet the solution is quite simple. 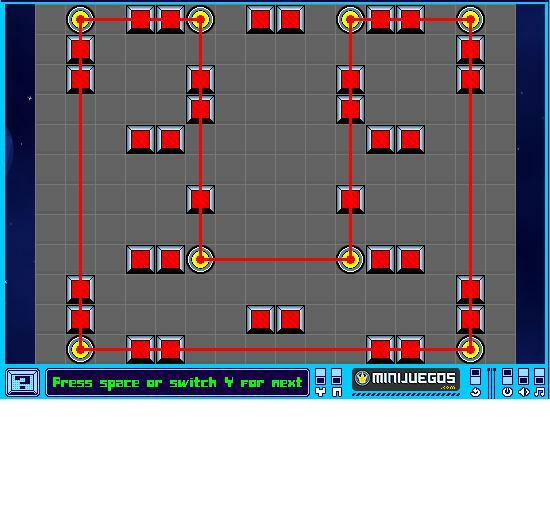 You can try a brute force solution like I did, and it will come to you just a few moves in. Level 92 - 796. This solution is about 5% ingenuity and 95% common sense. Level 93 - 949. 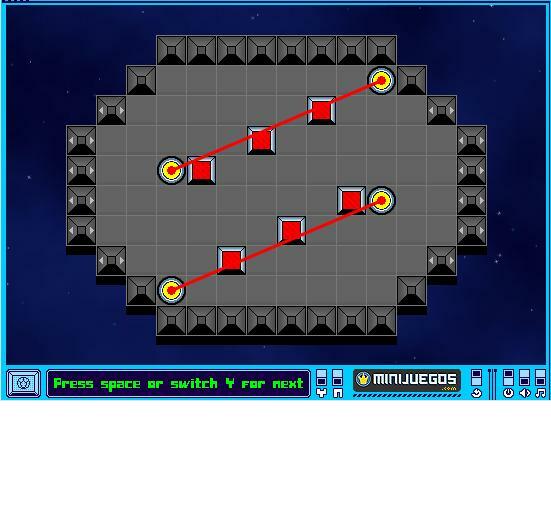 This level combines the skill you learned in level 53 with the skill you learned in level 86. Level 94 - 974. Once you know what the solution is supposed to look like, it's not hard to get there. Level 95 - 1022. Too easy to be level 95. 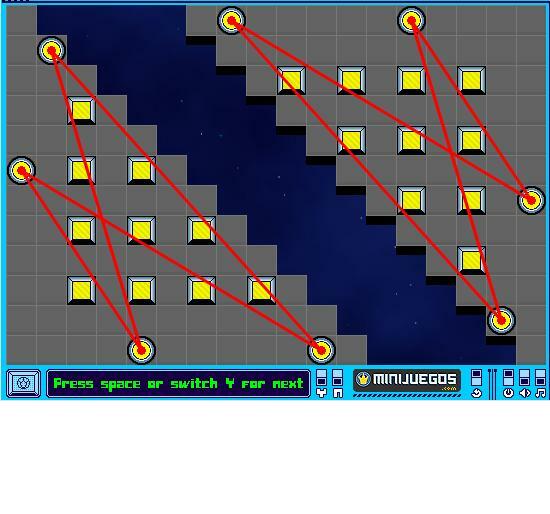 Level 96 - 737. 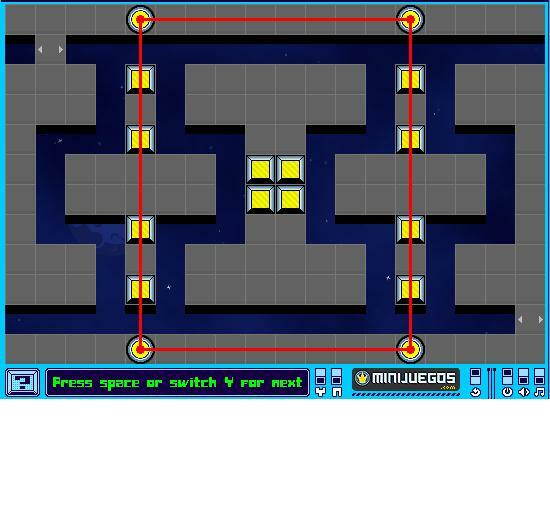 Definitely the hardest level in the game, but you get 15 steps of leeway. 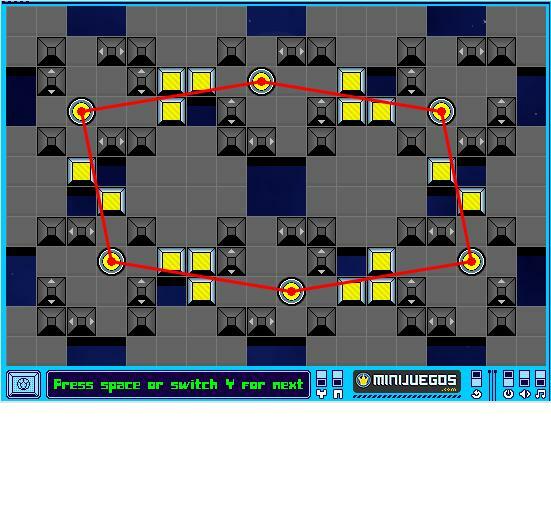 Level 97 - 966. 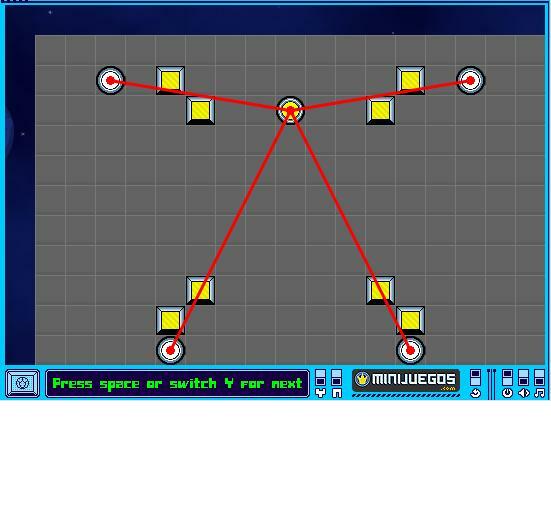 All the movable laserspots should come out the left side, although it's possible to bring one out the right instead. 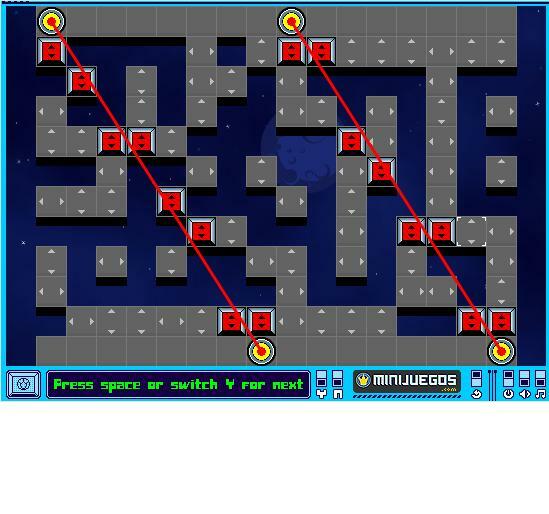 Level 98 - 186. You don't need to touch any laserspot more than once. 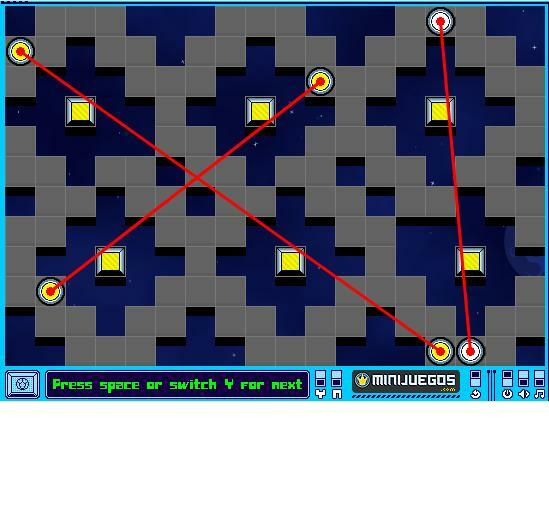 Level 99 - 1039. 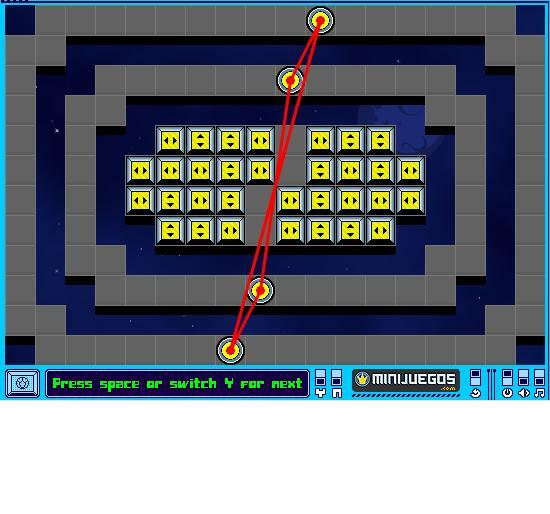 The first trick is to get 2 laserspots below you and 2 above you. Level 100 - 986. 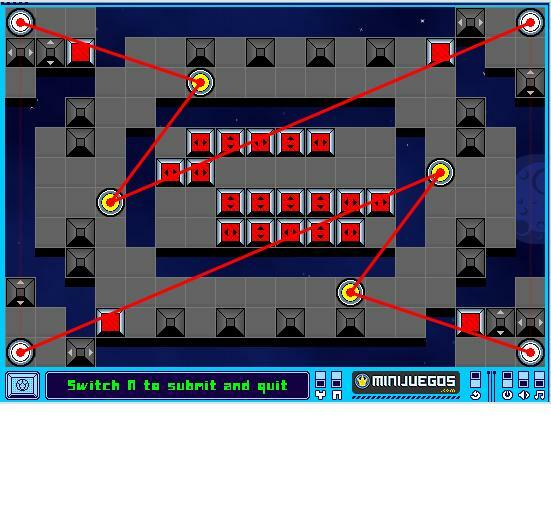 Note: After you're done, ignore the directions given by the game and click "N" to submit your score instead. As always, if you have a better score in any level than the ones I've posted here, please let me know. Hi i like your walkthroughs for all levels they are good. 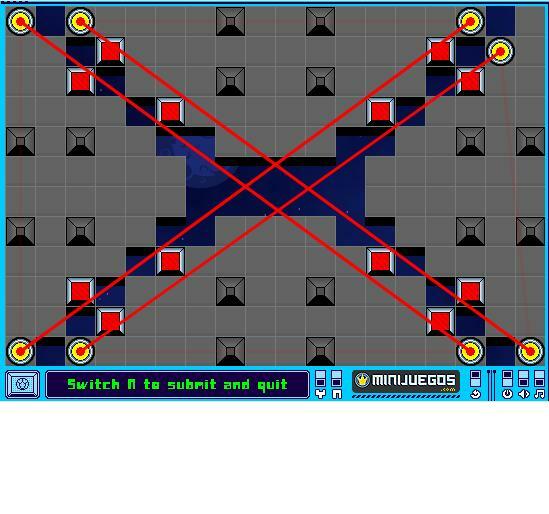 However as the levels get tougher (especially some levels) i felt that just referring to a screenshot wasnt enough lol, because many a times i was getting stuck as to how to get that final positioning. Anyhow they are good none the less. I would like to point out that some of your spoilers have dead links like that of level 73, can you please repost this walkthrough, i would really appreciate it as im stuck here since the past 2 days lol. Sadly, I find myself no longer able to submit a score in this game. Was this deliberately disabled, or was a new bug introduced while attempting to fix something else? The game is not fun to play anymore if I can't submit a score. 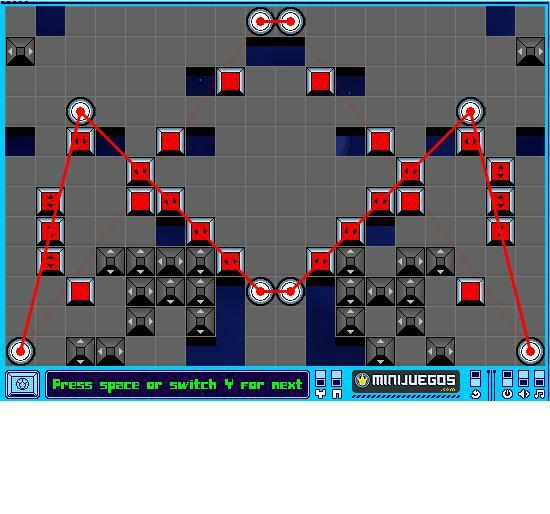 By the way, my total score last time I played through all 100 levels was 336,902. 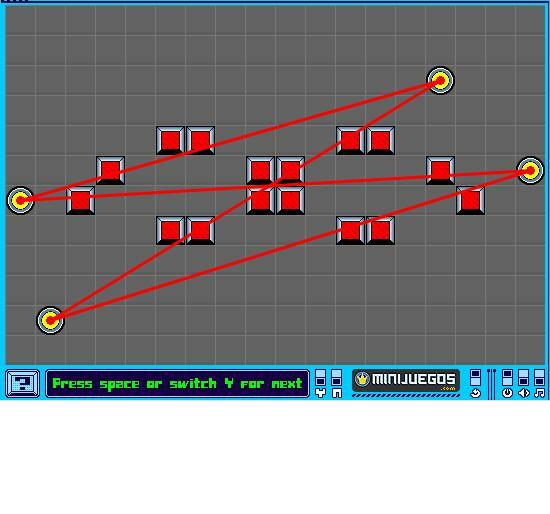 I submitted a bug report to MindJolt, but I think they've dismissed it as another case of someone who just doesn't know what they're doing. Please can you help me with level 73 screen fixed? I'm sorry level 73 isn't loading for you. I just checked and the game is the latest version that's available for it. 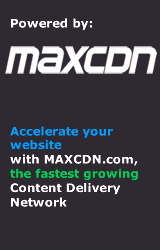 Try emptying your browser cache and reload the game? I hope that helps. What I meant to say: I cant pass level 73 and the pictures wont load!! Oh! Sorry. 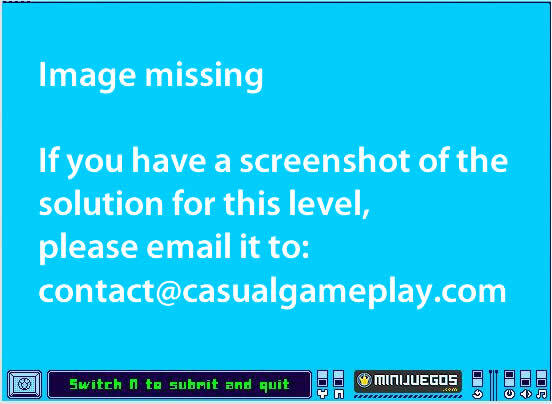 Looks like the image solution for level 73 is the only one we don't have. 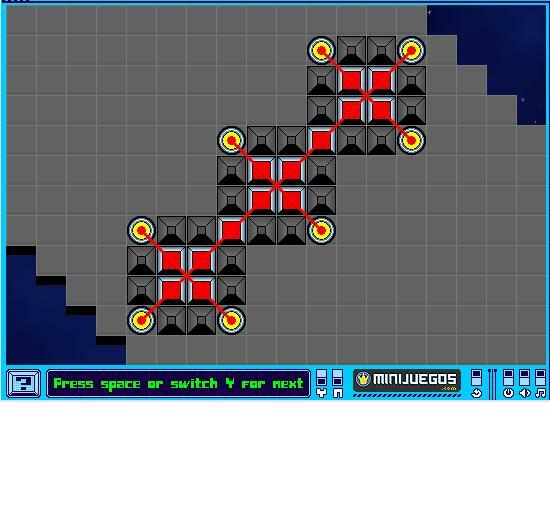 I'll try to track down a proper image for that level and post it as soon as I'm able to.